The bad weather and lack of coastal paths made this more of a bus tour than a walk this week. I seem to have followed the A9 all week. A constant theme has been locals telling me this is the worst summer weather in living memory; there’s never been this much rain before, the harvest is ruined, farmers are being forced to sell their cattle as they’ve got no feed for the winter and Orkney has had 95% of its annual rainfall after 6 months. All quite depressing to hear day after day when you’re getting soaked. 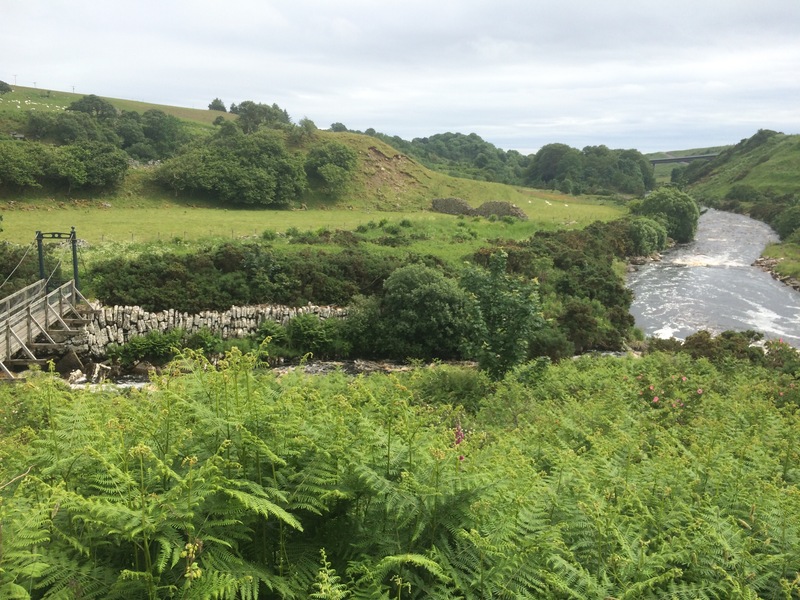 The terrain has changed lots over the week as I’ve moved from the sea shores of Easter Ross, through Sutherland with its big hills and straths cut into them, and finally into Caithness, the land of the flows. There seems to be a natural divide (the Kildonan Strath) between Sutherland and Caithness as suddenly the land flattens out and becomes wet and boggy. 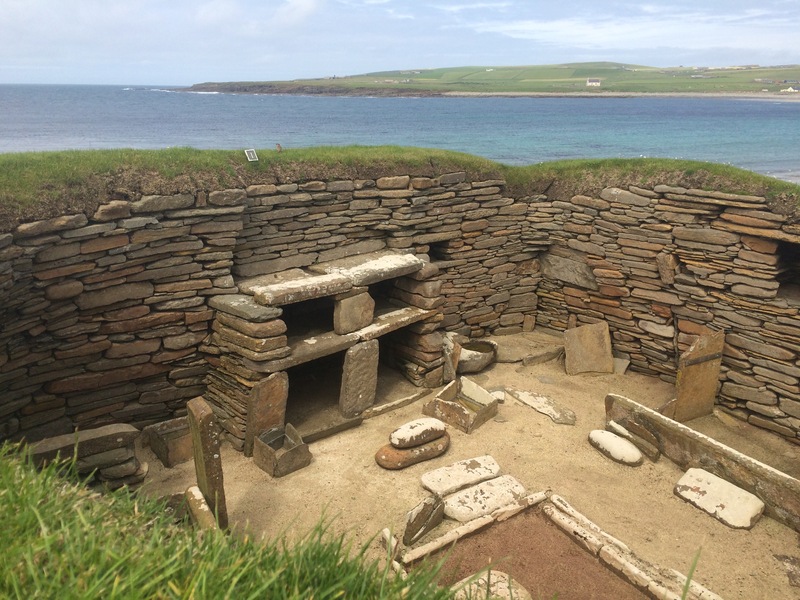 I have indulged in sightseeing and history this week and it’s been fascinating to learn about the Picts, the Highland Clearances and then a bit about Orkney’s Neolithic history. Many of the towns here have museums or heritage centres; I only went in a couple. The locals seem very proud of their history. Great to have some company again this week, and to get a new tent and rucksack. Both seem pretty good so far and my pack feels much more manageable, although it might be the lack of walking mileage! I don’t see myself walking consistently around here as it’s too wet and the ground too boggy to do much off-piste so I think I’ll be sticking to the roads, which means more buses for me. Being in the North Highlands makes me think that either a campervan or a road cycling trip would be the best way to see the place and get around…maybe next time! Hopefully the weather will improve sometime soon as it would make the views around even more stunning (and would take a better photograph). It rained heavily and was very windy during the night but my tent survived. Putting on wet boots was not pleasant this morning but they dried out a bit during the day and at least I didn’t have to walk far. A cup of tea and a bacon and egg roll from the burger van opposite the ferry made a fine breakfast and then we were off to Orkney, the land of farming and extreme wind. 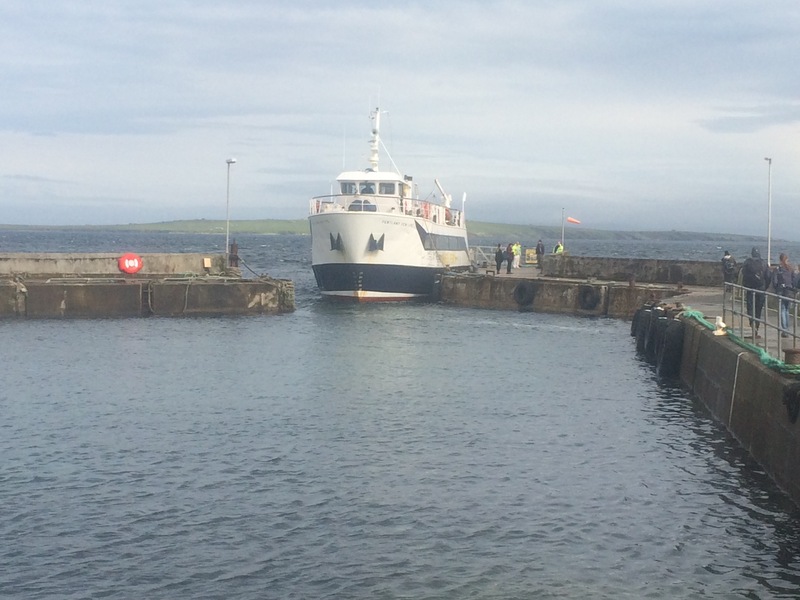 It took 40 minutes by foot ferry across the Pentland Firth to Burwick on South Ronaldsay. There was a lot packed into a long day but it was a good way to see the islands quickly and we had a very knowledgeable, and entertaining, guide. 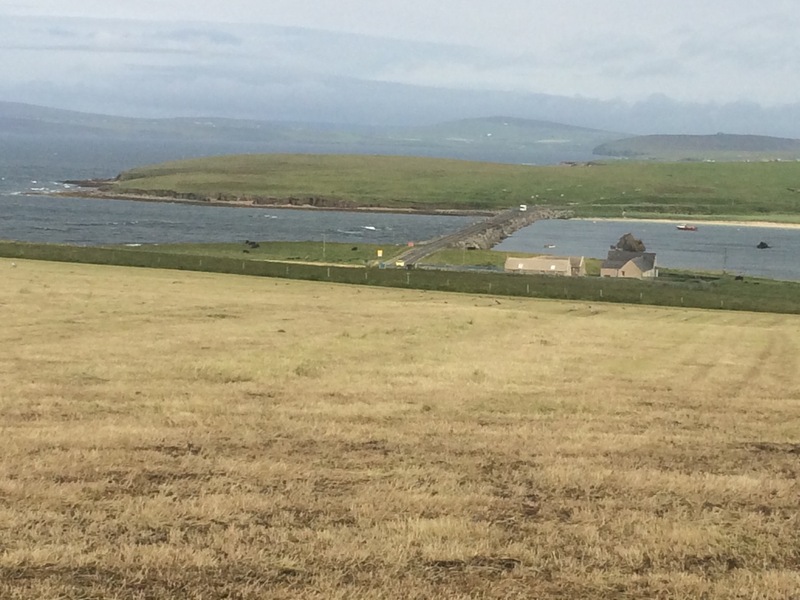 We drove over the 4 Churchill Barriers, erected to stop U-boats entering Scapa Flow, which is a huge natural harbour that was used by the Royal Navy. 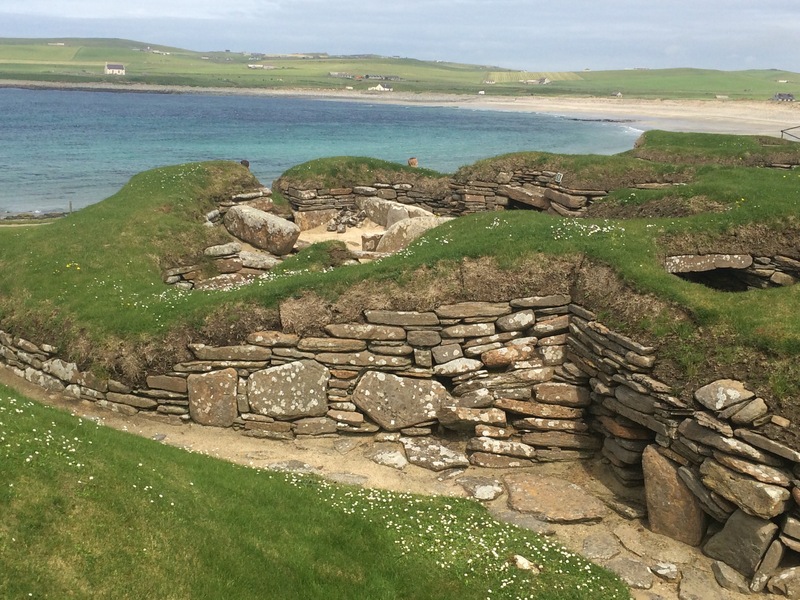 We visited Skara Brae Neolithic village at the Bay of Skaill. It is 5000 years old and yet the ‘houses’ look strangely modern with beds, shelves, even a type of larder and a mantelpiece. 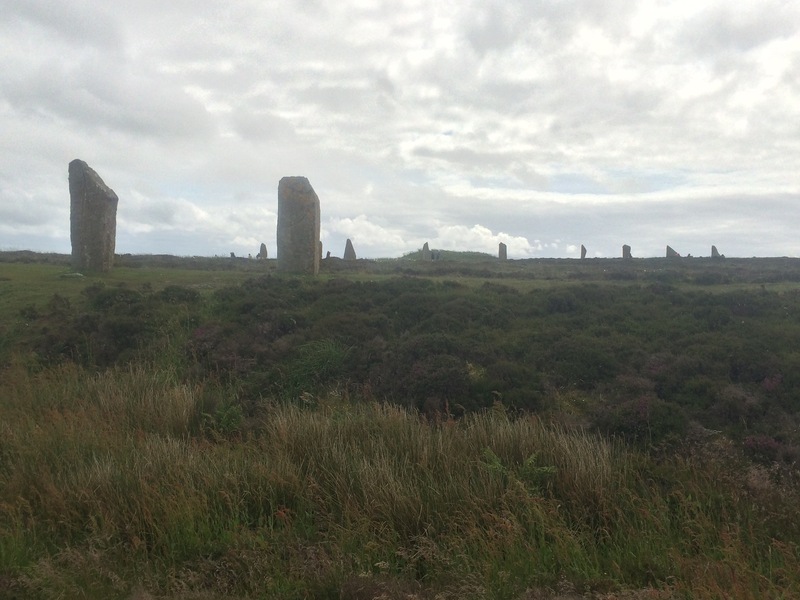 There is plenty of archaeology on Orkney and we saw the Rings of Brodgar and Stenness, two stone circles that pre-date Stonehenge. 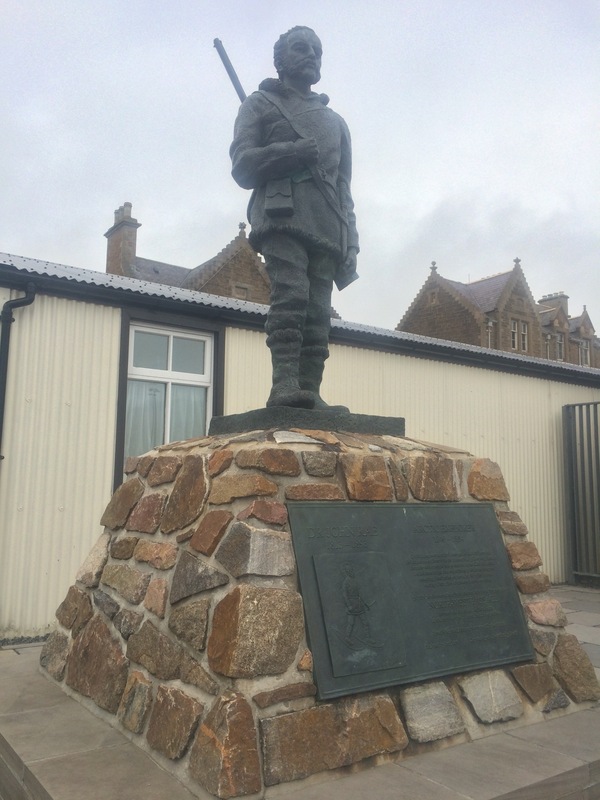 I learned a bit about Orkney’s history, such as the scuttling in Scapa Flow of 74 ships belonging to the German Navy after WW1. Also the close links between Orkney and Norway; the Viking heritage. 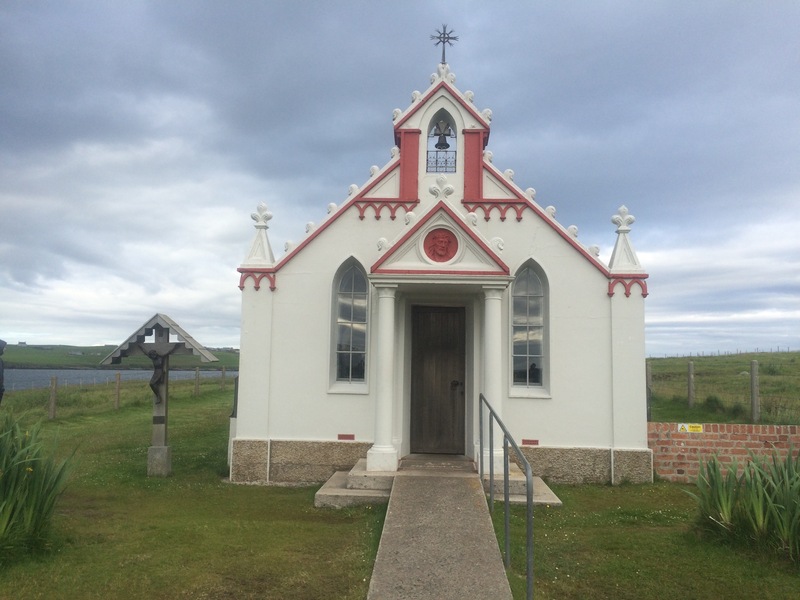 The last stop was at the Italian Chapel. 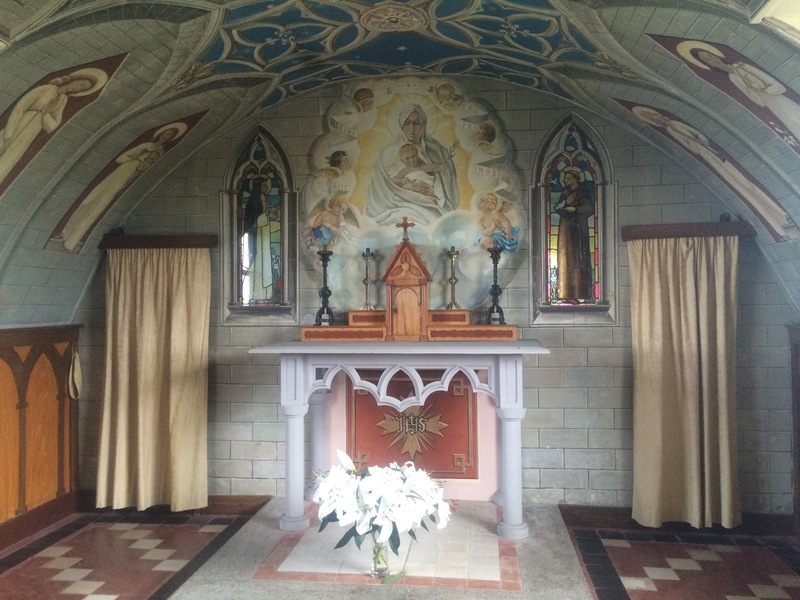 A remarkable church that was built by Italian POWs from 2 Nissan huts and a load of concrete. It is an incredible building that shows off some wonderful imagination, skill and artistry. Apparently it is one of the most visited sites in Scotland. 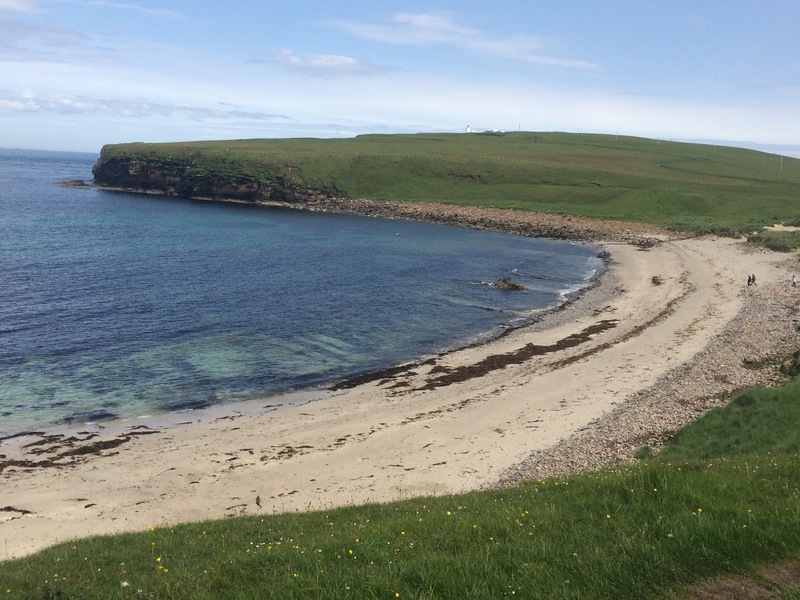 Having been to Shetland I was glad to get the chance to see a bit of Orkney, only 3 of the 70 islands (of which 22 are inhabited) but a few of the sights. It rained heavily through the night but had stopped by the time I got up at 6.30 am. I wanted to be away early so I didn’t have time to wait for my tent to dry and packed it away damp. Much easier with this tent and I wasn’t too worried about having to put it up sleep in it again tonight. A quick stop at Co-op for some breakfast to eat on-the-go and I was away. 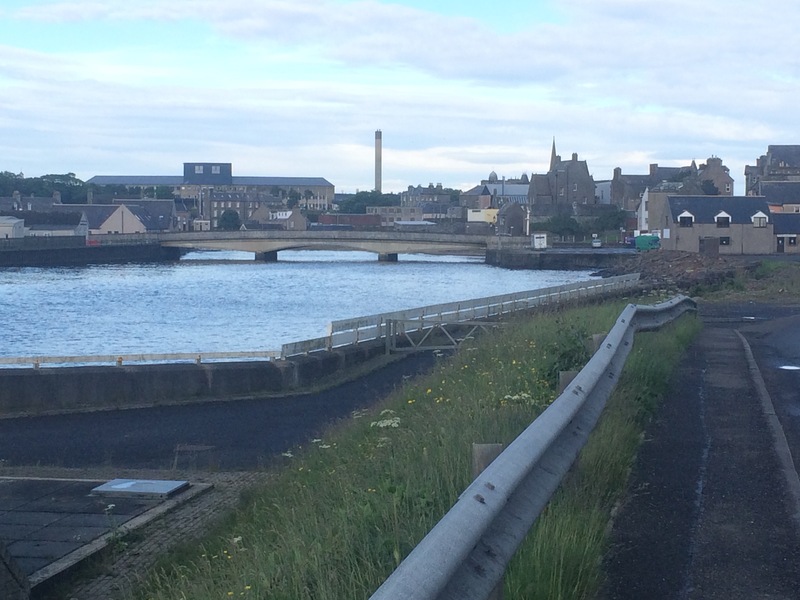 Wick is a grey and run down town. It looks rather sad. I did walk past the street that claims to be the shortest in the world. 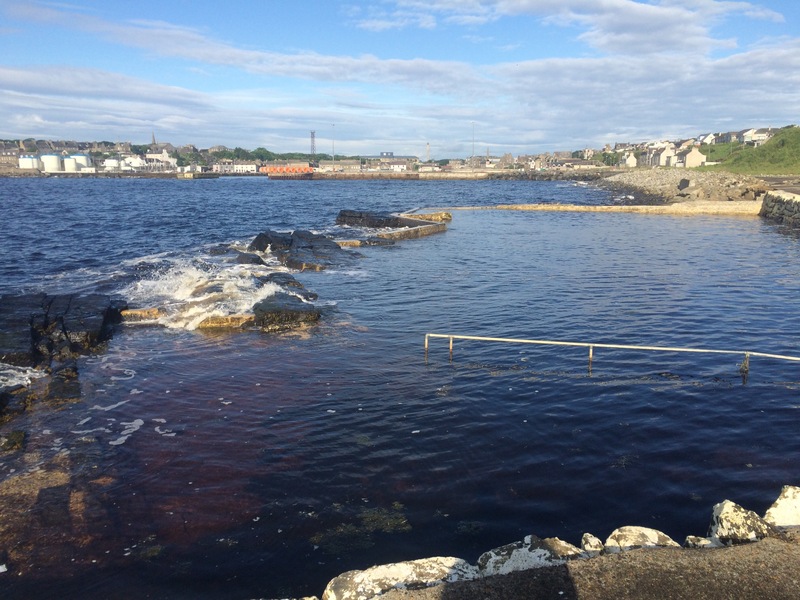 Walking out to the headland I passed an old swimming pool cut into the rocks. Like all the others I have passed, this one seems to have been abandoned to dereliction. 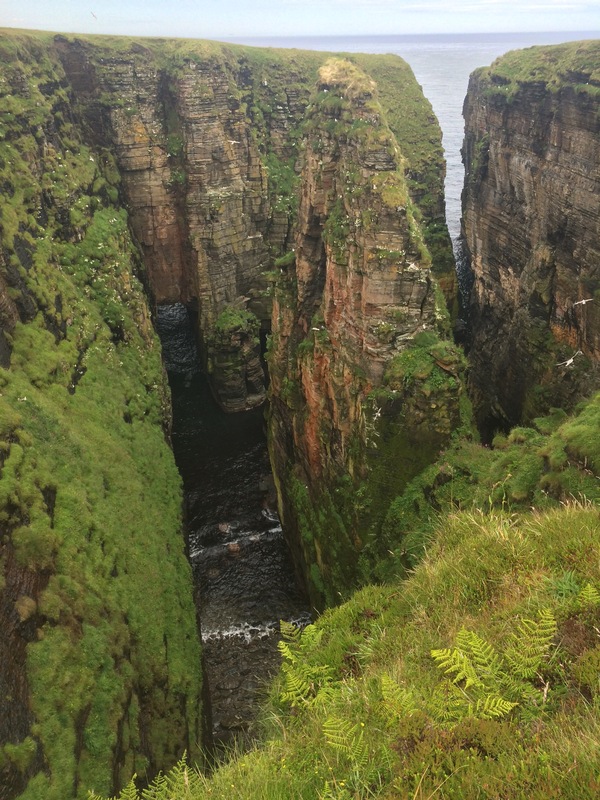 I made my way around Noss Head, following the cliffs. The sea looked blacker here, not dirty, just dark. I smelt the now familiar smell of seabirds and it was nice to re-acquaint myself with fulmars nesting on the cliffs. Even though it wasn’t rough the sea was crashing against the rocks and the cliffs, more so than usual. I walked through a couple of villages and they have Norse names around here. Staxigoe (translation: the inlet of the stack) claims to have been the first port in Europe to salt the herring. It was obviously overtaken by Wick at some point. 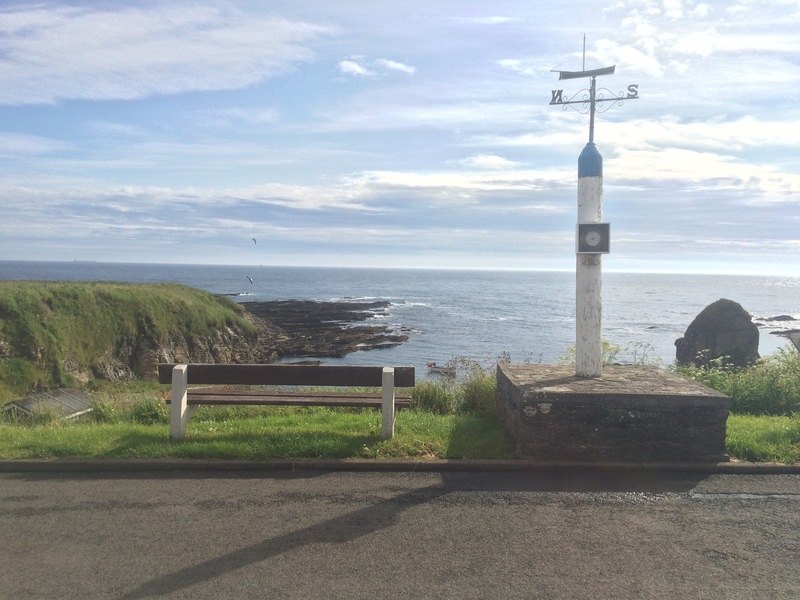 It has a mid 19th Century barometer above the harbour that the fishermen used to determine the sea conditions. I rounded Noss Head by the lighthouse and got a view across Sinclair’s Bay up to Duncansby Head. In the absence of any easy paths I climbed over the gate into Prince Henry St Clair’s Garden of Remembrance next to the lighthouse. It was an unspectacular green space that had plaques on the wall for various Sinclairs, including some quite recent. 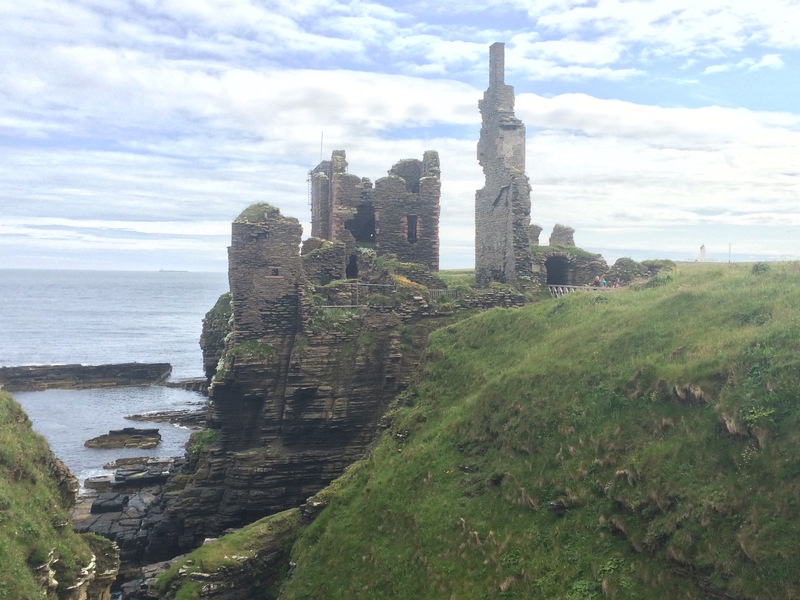 Within sight of the lighthouse, just into Sinclair’s Bay, was the remains of the 14th Century Castle of Sinclair Girnigoe. It was once the main residence of the Sinclairs and it has important historical significance. It is perched on a stack and would once have been very impressive. I was pushed back onto the roads here as there was no way through to Sinclair’s beach. I was joined by an 80 year old man out for his daily cycle ride and learned quite a lot about the area. Yet again I was informed this was the worst summer weather ever and apparently many of the farmers are being forced to sell their cattle because the grain harvest has been so poor that they won’t be able to feed the cattle in the winter. I also learned about the significance of Wick airfield during WW2 and how Hitler was expected to invade here from Norway. He was a very fit octogenarian. 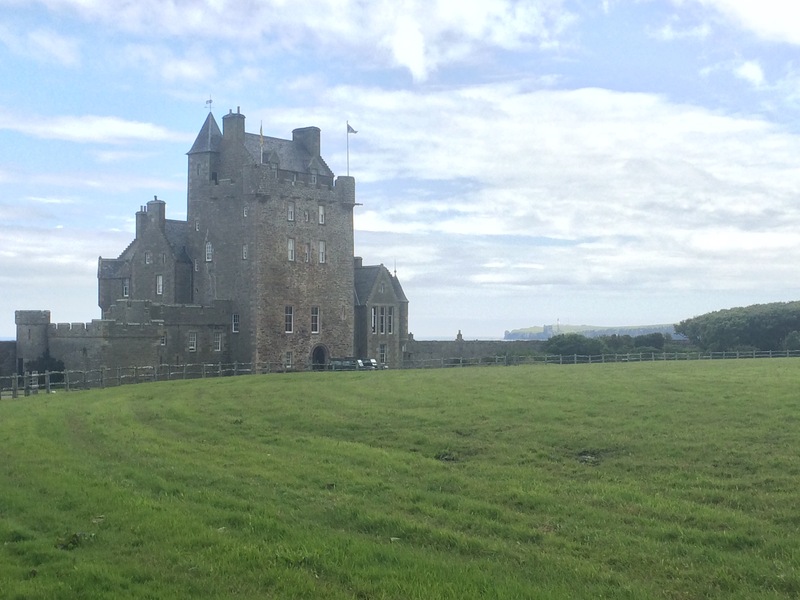 I found myself in the grounds of Ackergill Tower, a private hotel. No wonder it looked so smart. I was thinking it was a pity the Smuggler’s Inn wasn’t open, but I wouldn’t have been allowed in anyway. I had been aiming to catch the 12.49 bus from Keiss but I knew I’d never make it. If I missed the bus I could either wait for the 17.49 to John O’Groats or walk along the main road. I decided to try and flag the bus down in Reiss village and fortunately it worked. Apparently this is acceptable, and it is also possible to get dropped off wherever you want enroute. 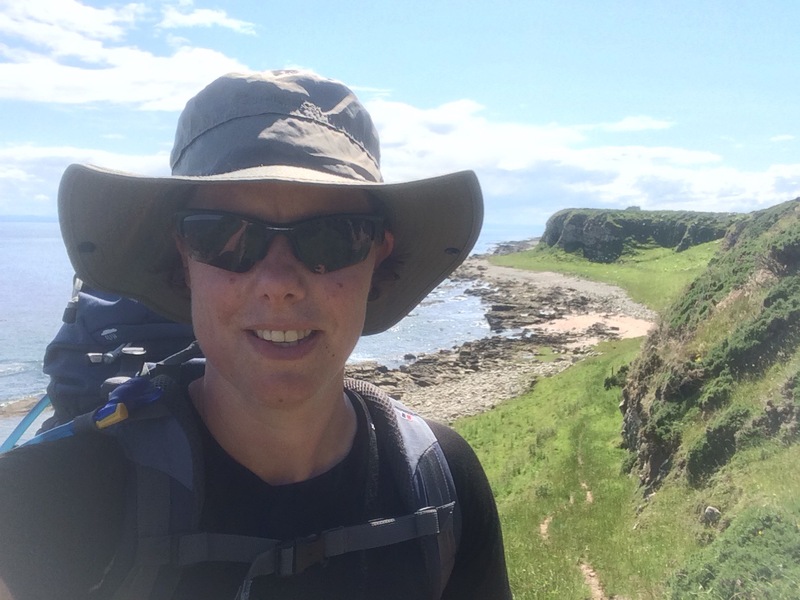 I got dropped off at Freswick so that I could walk the last bit of coast to Duncansby Head. It started raining (again) and the terrain was boggy. Not a good combination and after 2 hours my boots were soaked through and so was I. The coastline was very dramatic with high cliffs, narrow geos and lots of birds, including a few puffins. The Wife Geo was particularly spectacular. 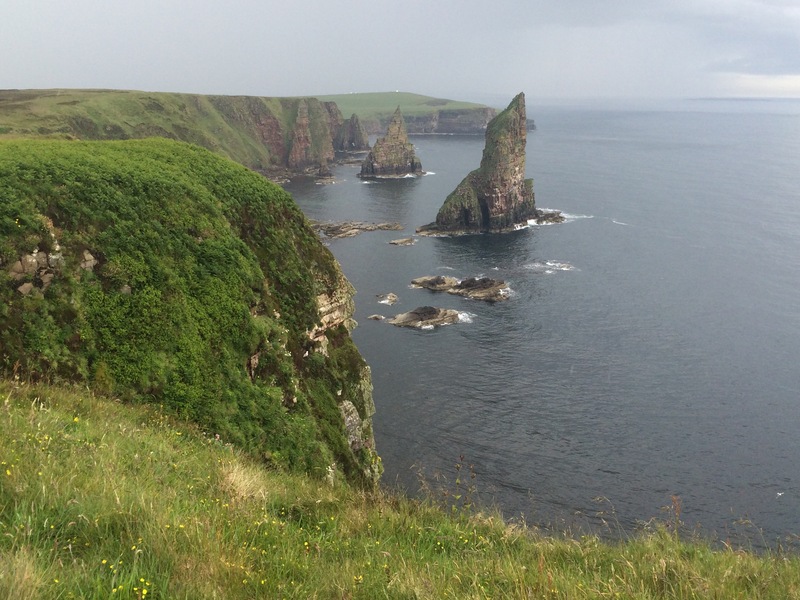 After what seemed like an interminable slog I could see the Duncansby stacks and lighthouse. It was a bit underwhelming to arrive at the most North Easterly point of mainland Britain, which probably had a lot to do with the weather. The visibility was not good enough for a clear view across the Pentland Firth to Orkney and the Pentlands. 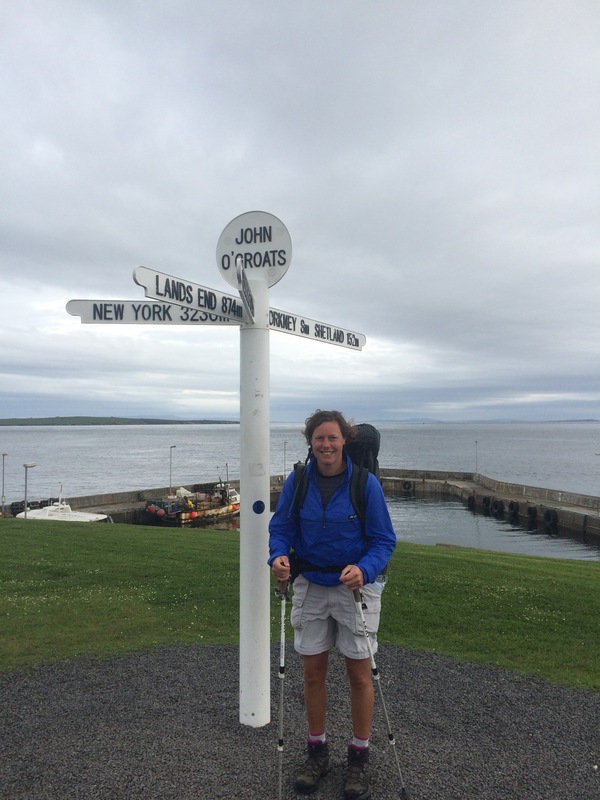 who had just finished walking LEJOG. His enthusiasm rubbed off on me. I did some laundry and walked up the road to the Seaview Hotel for dinner. So much for the South East being expensive, it was £4 a pint here! I awoke to heavy rain pounding the roof of the hostel and wasn’t enthused about starting the day. I had already decided to get the bus up to Wick anyway because of the lack of footpaths, the difficulty of the terrain and the A9 being the best route North. The first bus was at 11.30 am so I had plenty of time to get up and laze around catching up on my blog. 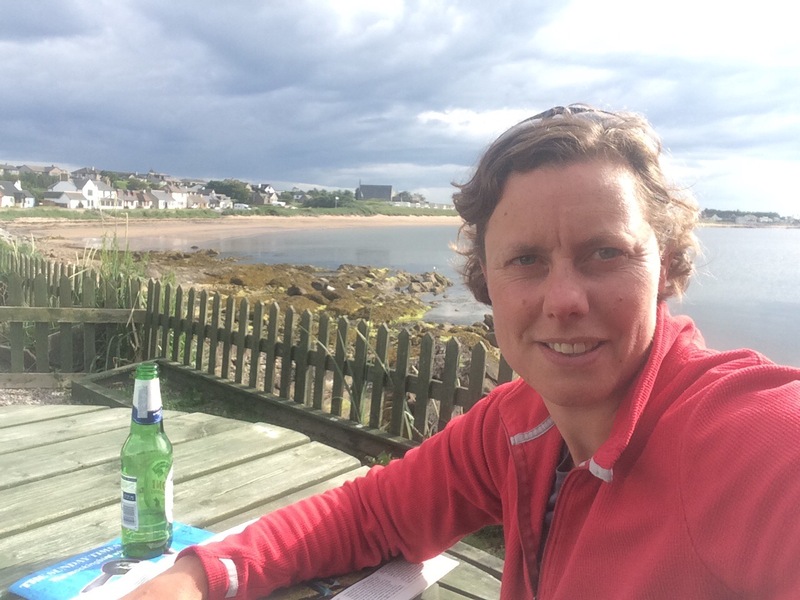 I got chatting to Catrina, who was catching the same bus on her way to the Orkney ferry, and didn’t get around to my blog. It was quite cold in the hostel, so cold that my washing hadn’t dried overnight and I spent all day walking around with a pair of damp socks in my pocket to try and dry them out. The bus was late but it arrived. The views down the hill to the cliff top were occasionally spectacular and occasionally shrouded in mist. The road wound around a few geos and up and down a few steep hills. 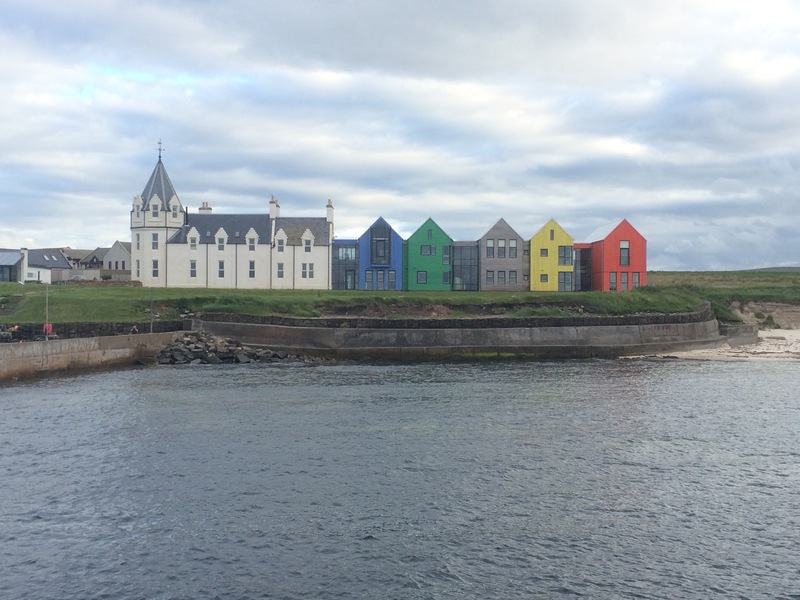 After a couple of miles I left Sutherland and entered Caithness, the most Northerly county on the mainland. I caught the bus as far as Dunbeath, where I had decided to get off and look around before getting the next bus (that gave me almost 3 hours). 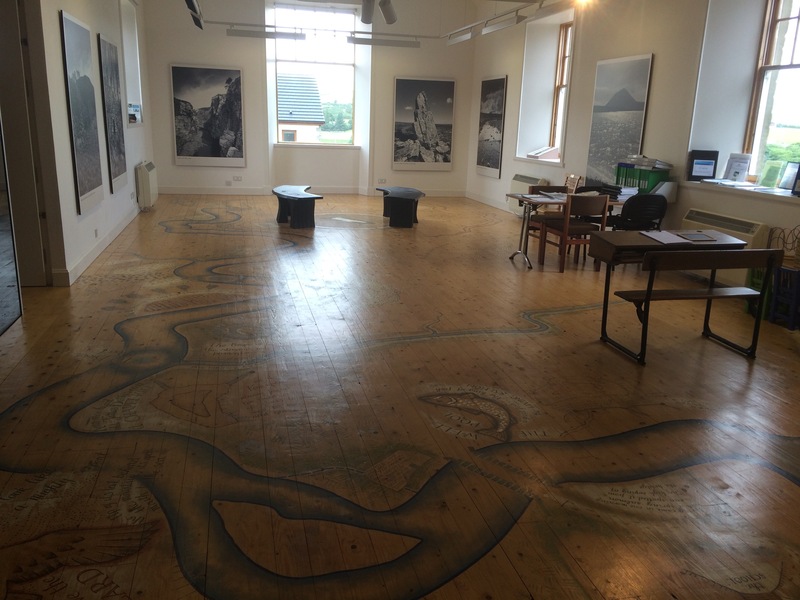 It proved to be a good decision as the Dunbeath Heritage Centre was really interesting and Christine, who worked there, gave me a guided tour and made me tea and biscuits. (She was pitying me on another cold, wet day.) Best museum ever. I had never heard of author Neil Gunn. 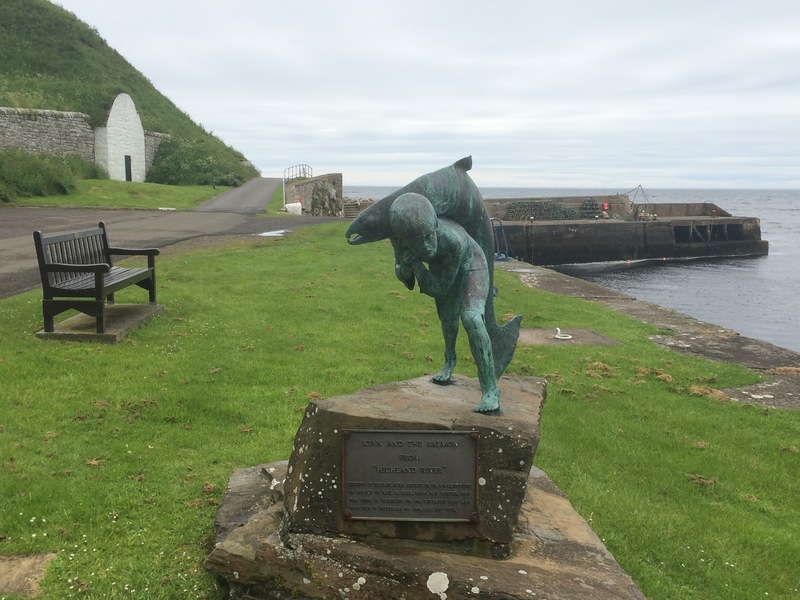 He was born in Dunbeath and many of his books relate to the area, the Dunbeath River and the local people in the early 20th Century. Christine expertly described the books and their context, and I will now have to read some of his work. 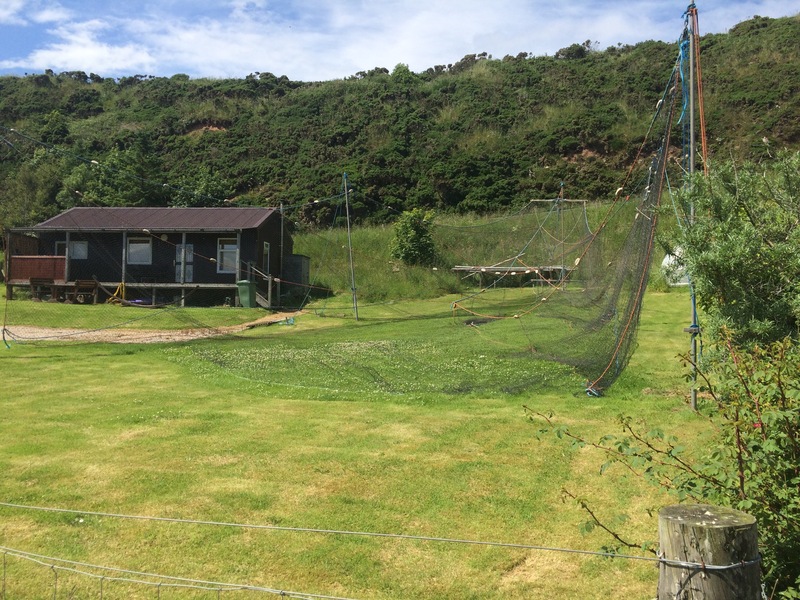 After reading all about the River, and following Christine’s instructions, I walked down to the harbour, complete with salmon bothy and boat shed. From here I had a great view of Dunbeath Castle, that has been restored and now looks like a big house, which is what it is. 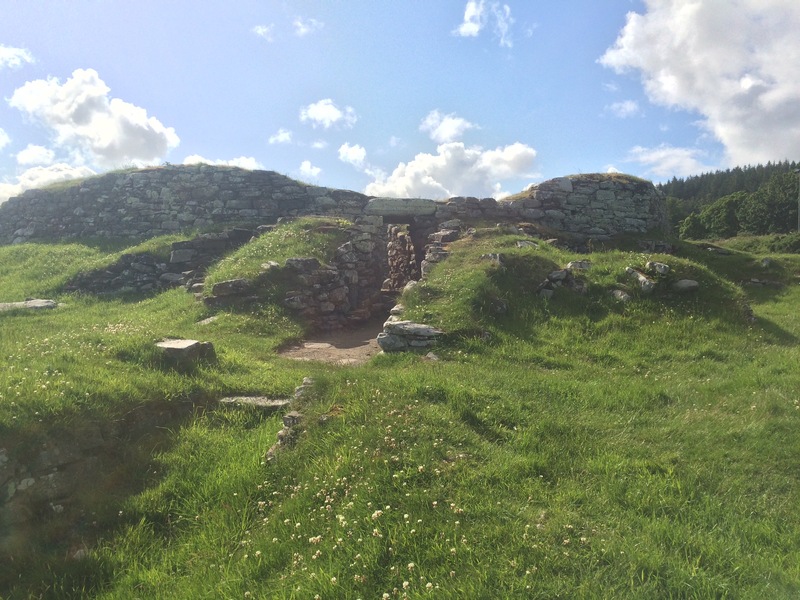 I walked up the river for 15 minutes to see Chapel Hill and the 2,500 year old Broch. These are both of historical significance and the locals claim the place has a feeling. 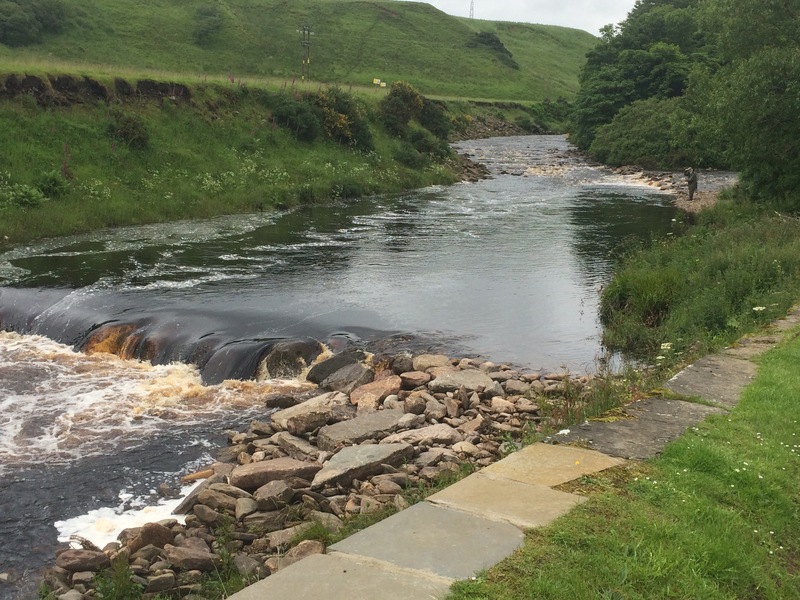 I was admiring the River, which was the same deep red/brown as the Helmsdale River and should be full of salmon at the right time of year. I did see a fisherman on the bank, wearing all the wading gear. 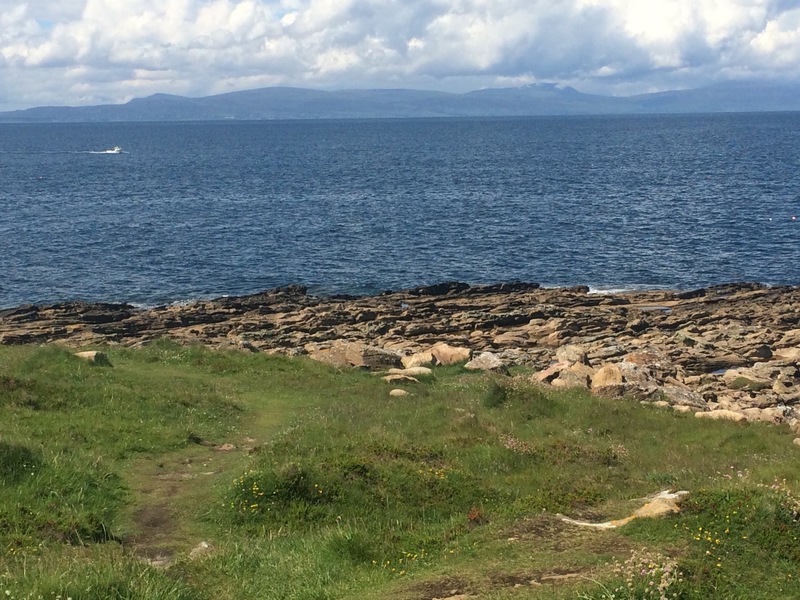 Can you see the fisherman on the right of the photo? I got back up the hill in time to catch the bus to Wick and once again enjoyed the views. It was just possible to see the Beatrice Oilfield, the only one visible from mainland Britain. Without a car it did mean I missed out on a few landmarks like the Hill O’ Stanes (Hill of Stones), a few stacks in the sea and more brochs. I arrived in Wick and walked to the campsite to pitch my tent before walking back into town to get a new battery for my watch. Being in town I stopped at the Norseman Hotel for an early dinner. It had stopped raining this afternoon but more was forecast this evening and through the night. I was a little chilly during the night but survived well in the tent, and no condensation! It was so much easier to pack away this damp morning than my other tent. Another cold, damp day in store with showers. Wonderful Scottish weather. After a lazy morning and breakfast in the campervan we set off for Helmsdale. I was not going to walk this section anyway as there are no coastal paths and the A9 and railway line run close to the shore. It was nice to get a lift and company. Getting a lift also means we can stop in different places to look at the scenery. Helmsdale is a small town at the end of the Strath of Kildonan. 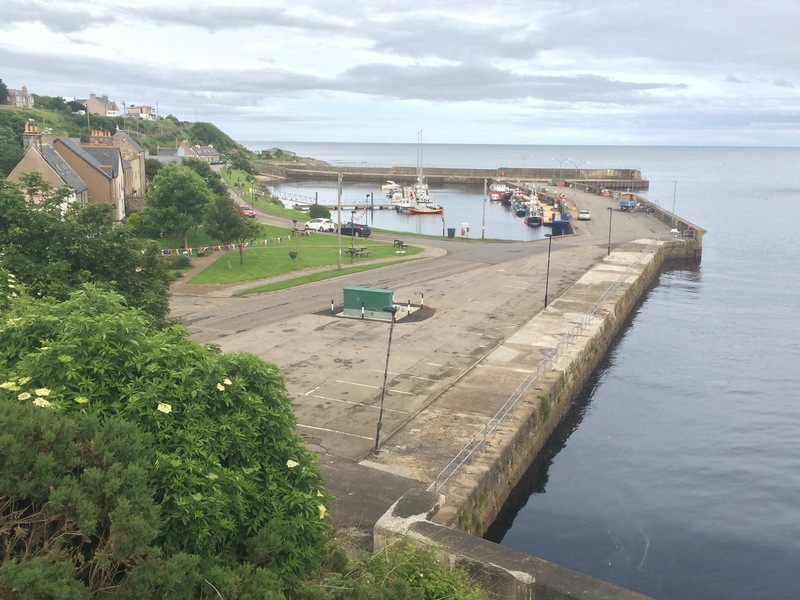 Its situation affords a lovely view up the Strath (wide, shallow valley with the River Helmsdale running through it) and it has a nice little harbour. 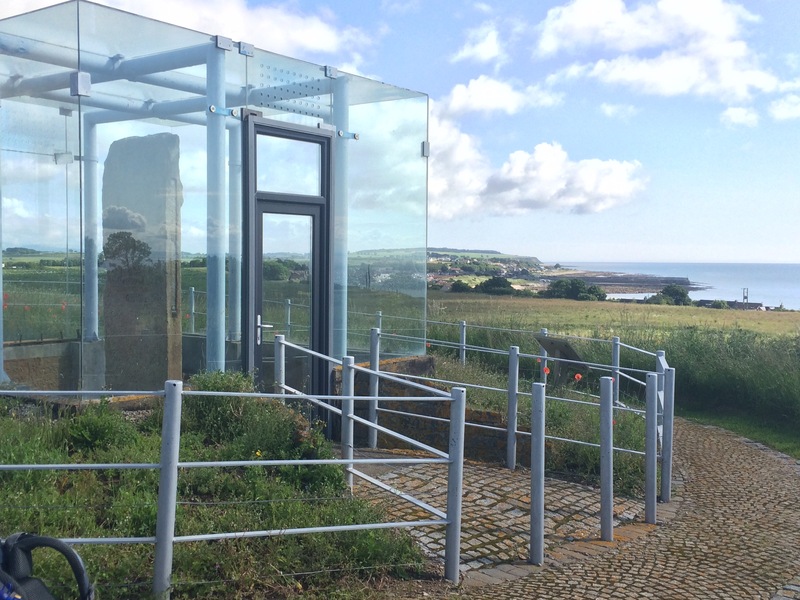 We spent a couple of hours looking around the Timespan museum here, mainly to get a better understanding of the story of the Highland Clearances that took place from about 1813. The landowners realised sheep farming was more profitable than crofting so they kicked out most of their tenant crofters. Many emigrated, or else they were given accommodation and fishing boats and had to learn to become fishermen. Extraordinary story. 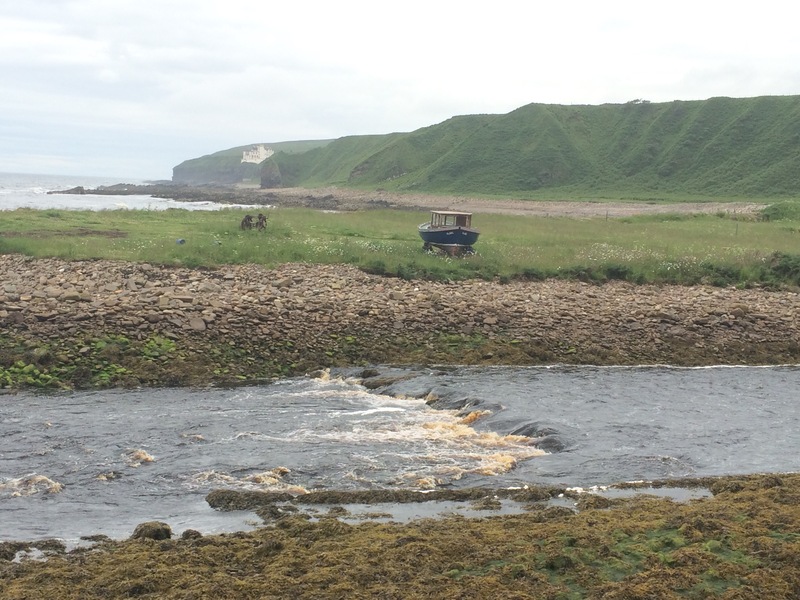 When the First Duke of Sutherland evicted the crofters from this area in 1813 many emigrated (in reality they had no choice as they had no rights) to Churchill and the Red River in Canada, hence there is a strong connection with that area. 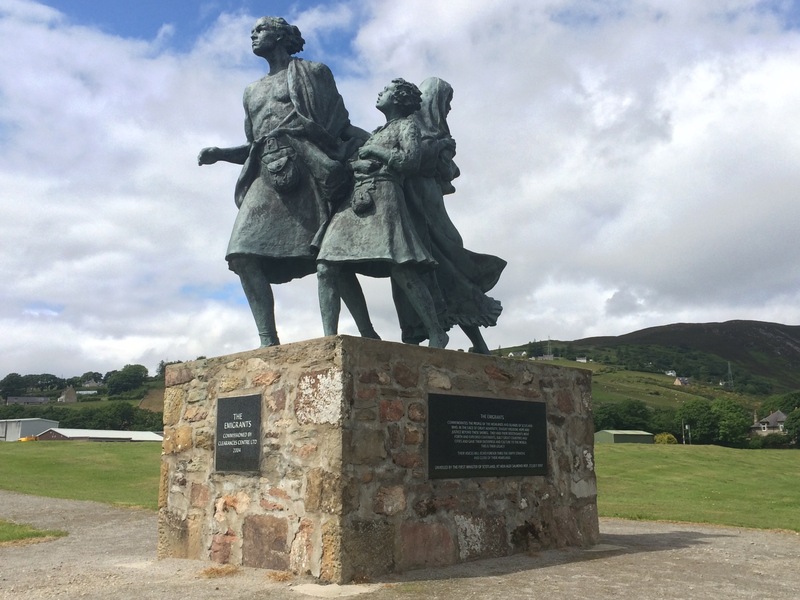 There is a large memorial to The Emigrants on a hill overlooking the town. 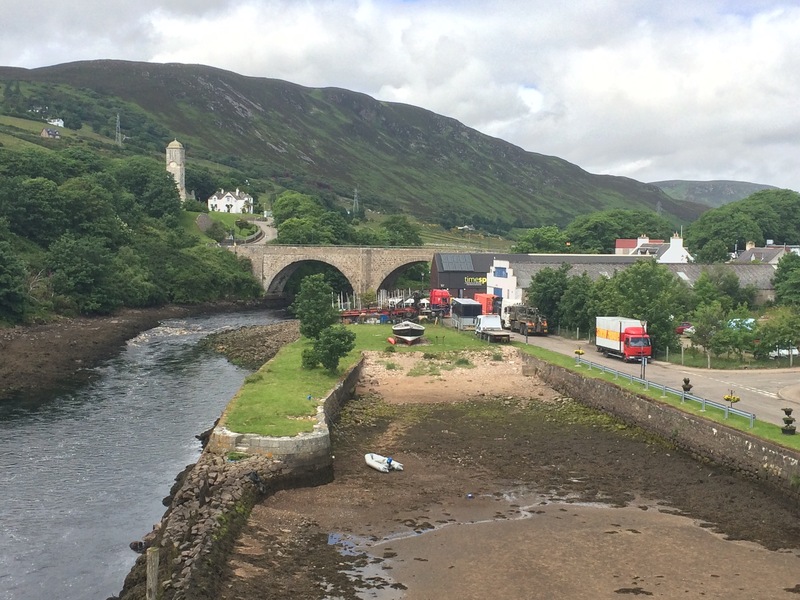 This is also the town to come to if you fancy panning for gold in the Helmsdale River. Or you could just go salmon fishing. Ali and Morna left me here and headed home. I was booked into the hostel and spent the rest of the afternoon sheltering from the rain in a cafe trying to plan ahead. 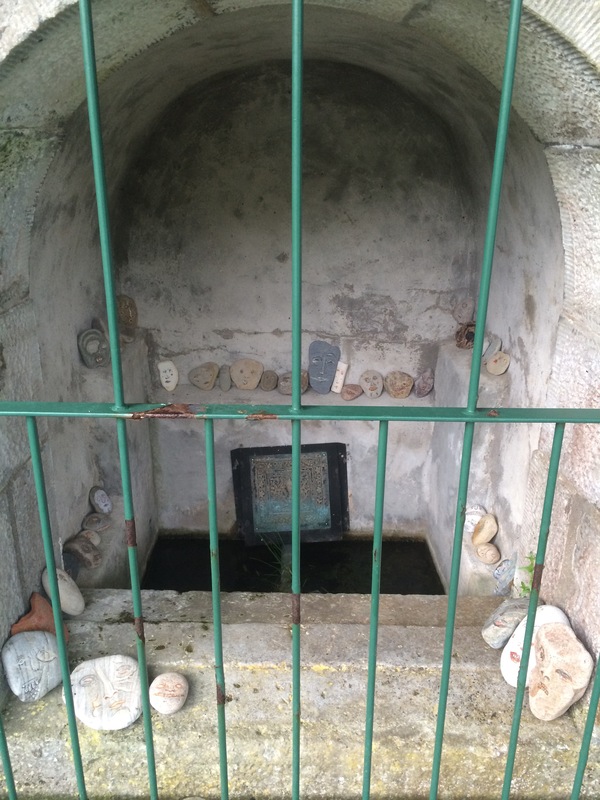 I went for a short walk up the river as far as St John’s Well, a curious little building containing lots of stones with faces painted on them. I went for fish and chips in La Mirage, the fish and chip restaurant recommended by Clarissa Dickson-Wright of Two Fat Ladies fame. I ordered a small fish special as the regular sized one came with 2 enormous haddock, as well as bread and butter and enough hips to require a plate of their own. It was a funny meal but very nice. Considering most towns up here don’t even have one pub, Helmsdale is doing well as it has 4 along the main street, as well as a restaurant and a cafe, and this evening I didn’t even need one! The hostel was nice and there was a French family, an Italian couple and a Scottish lady staying the night. I got a few tips for my trip and Catrina gave me her mum’s number who lives in Drumbeg. It’s raining again! Not a good start to the morning when I discovered 2 ticks buried in my right leg. They must have been there for over a day but they weren’t full of blood. I had to use my new tick-remover tool. Once that was done it was all about the excitement of new kit. 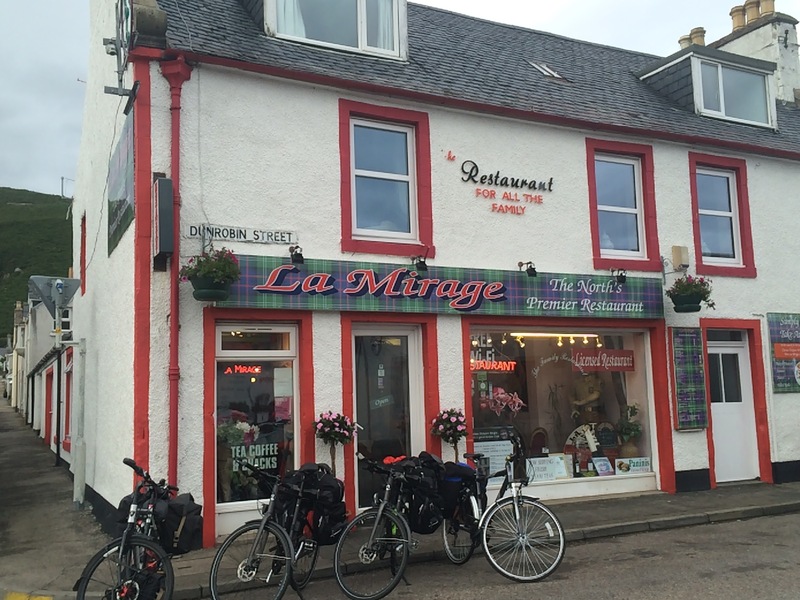 Ali picked me up and we started with coffee and a cake at the patisserie in Dornoch; no sense in rushing things! 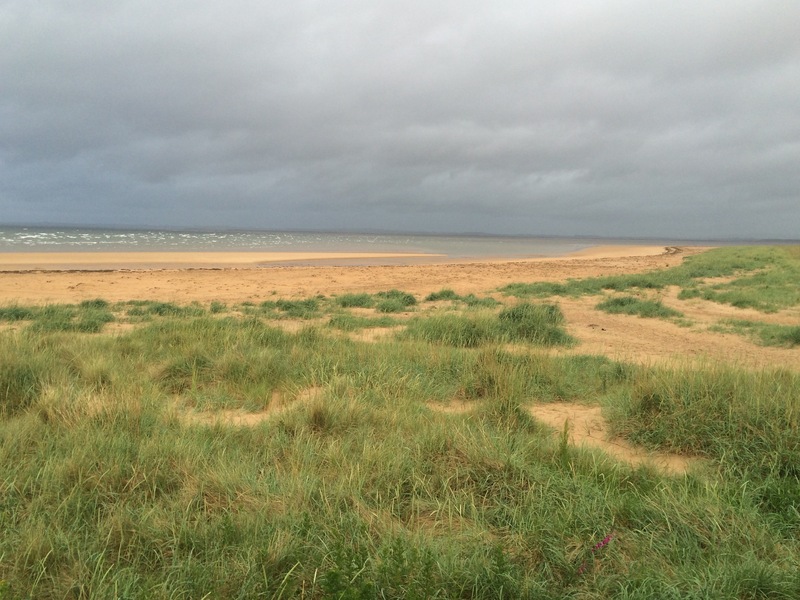 From Dornoch Beach Morna and I walked the 2 miles along the coast to Embo, which seemed to be one giant caravan park. 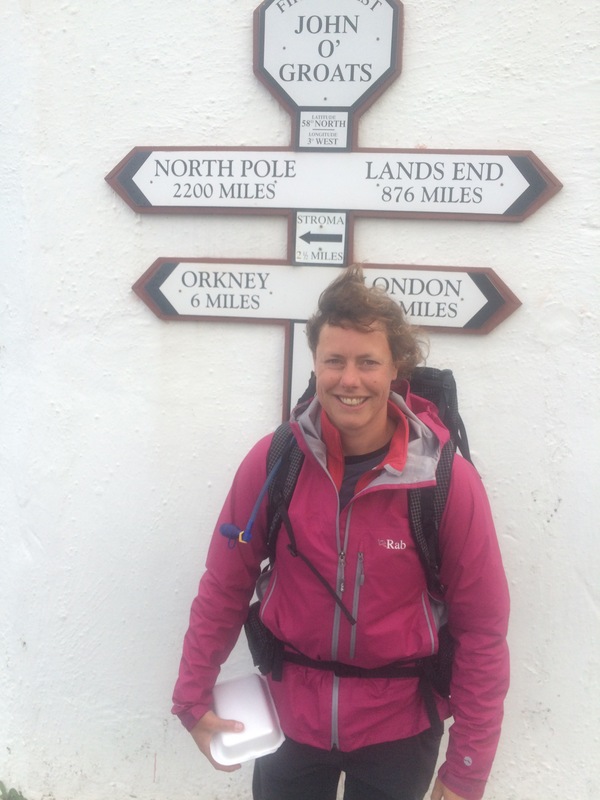 It was a chance for me to try out the new rucksack, adjusting the straps etc as we went. After 2 miles I was feeling pleased with my purchase as it seemed comfortable and quite a bit lighter and more manageable than my old pack. 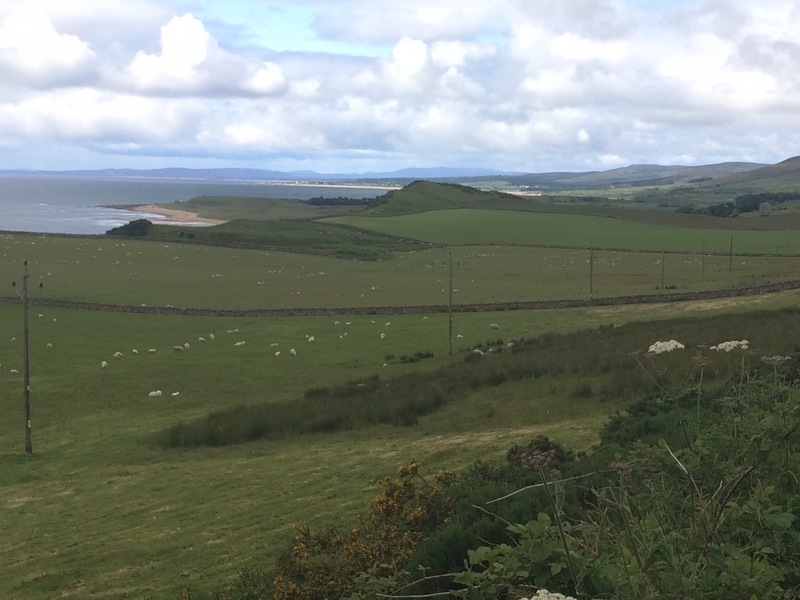 Ali picked us up in Embo and then we drove to Golspie, stopping a couple of times to admire the increasingly hilly scenery. 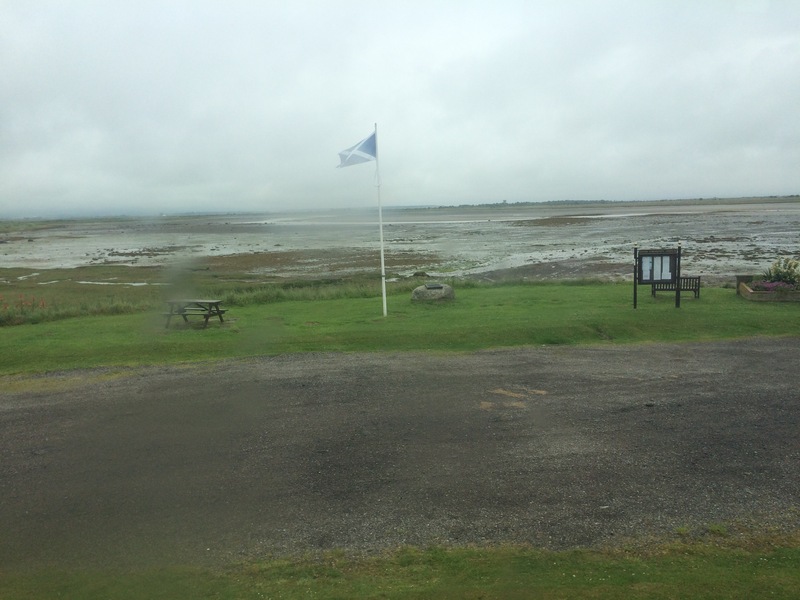 I was happy to be driving around Loch Fleet in the rain; the tide was out and there were a few seals on the shoreline. 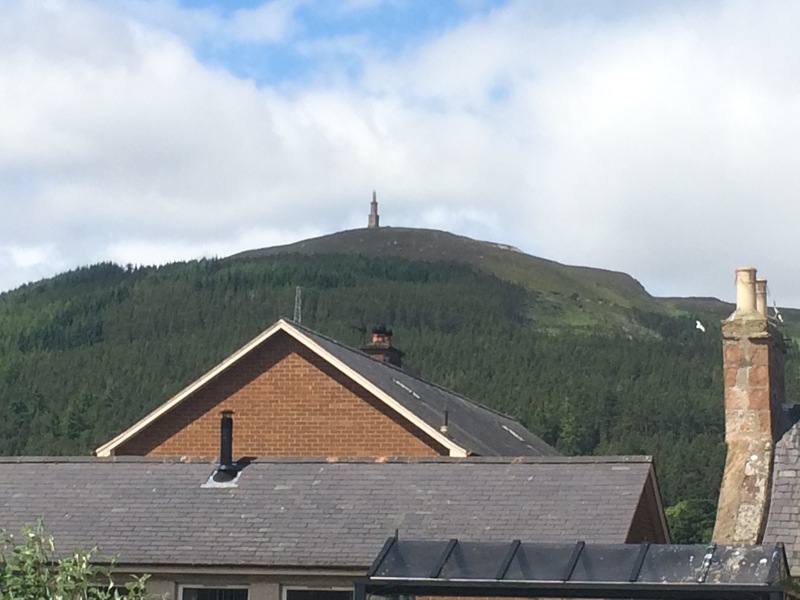 The town of Golspie is at the foot of Ben Bhraggie, a classic-looking hill with a 31m high statue of the First Duke of Sutherland, known as the “Mannie”, right on the top. I thought it was interesting that the information board listed all the criticisms of the First Duke of Sutherland and nothing positive (he was associated with the Highland Clearances). 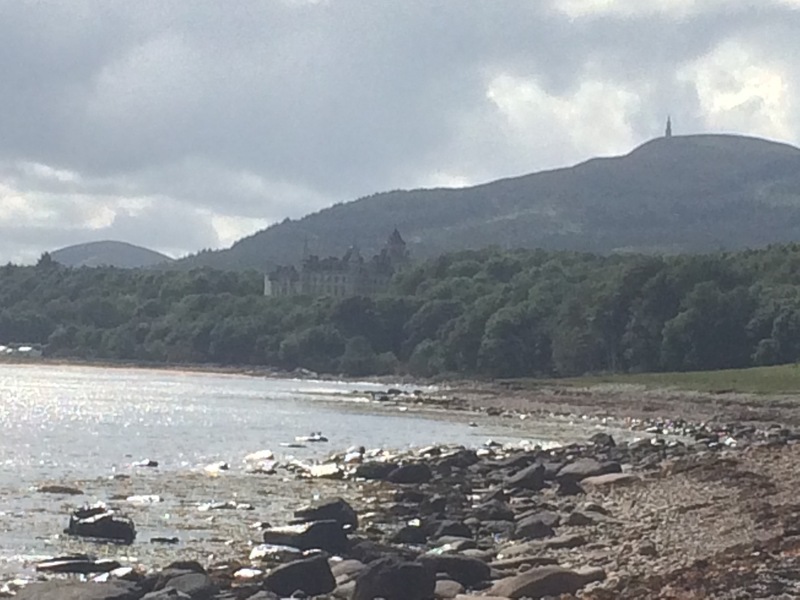 There is a walk inland from Golspie called the Big Burn Walk that is very popular, but I didn’t have time for that as we were heading along the coast. 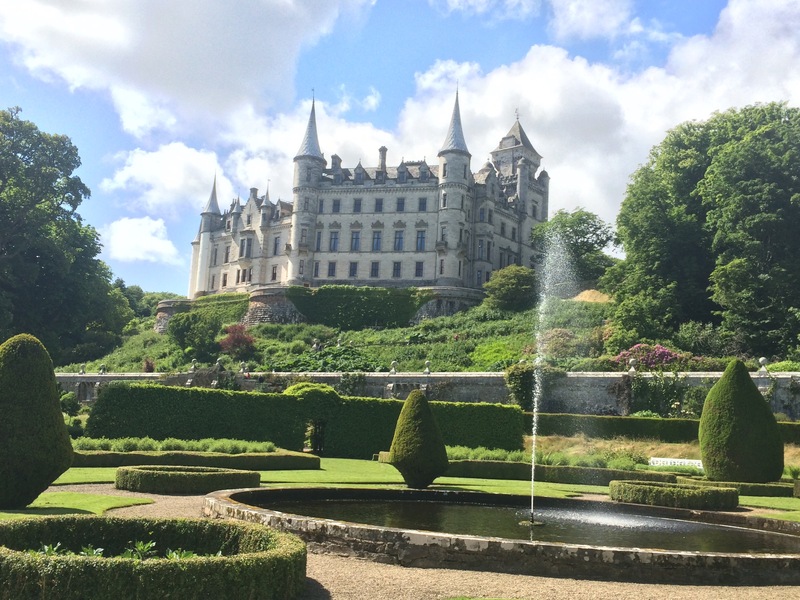 Just outside the town is the rather stunning Dunrobin Castle, home of the Sutherlands. It has 189 rooms and is still a home, although it is also open to the public. 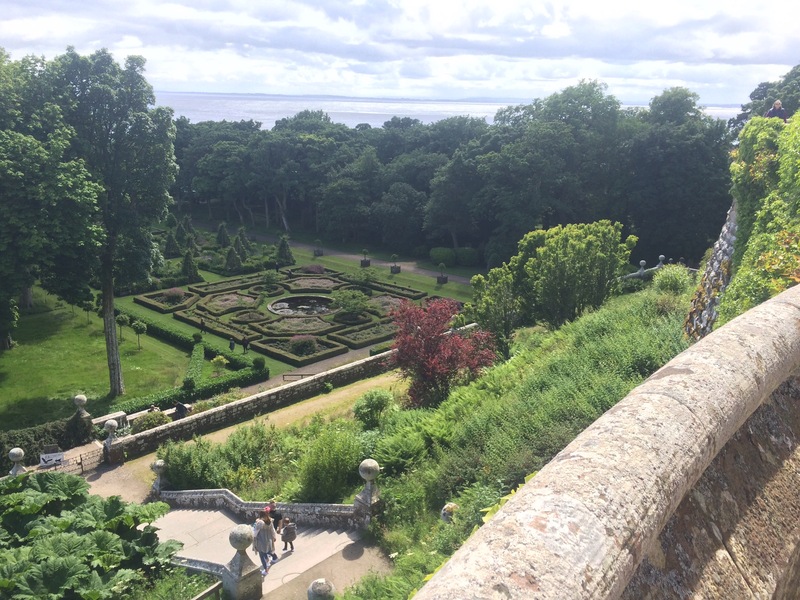 We decided to take a look and were just in time for a falconry display in the magnificent gardens. It was the best display I’ve seen as the falconer was very good. I enjoyed my second sighting of a peregrine this year! I much preferred touring this castle to Bamburgh; there was so much more to see. TheSutherland history is quite complex as they went from Earls to Dukes and back again. The main thing I noted was that the First Duke of Sutherland started out life as the Marquis of Stafford, so was in fact a Midlander. 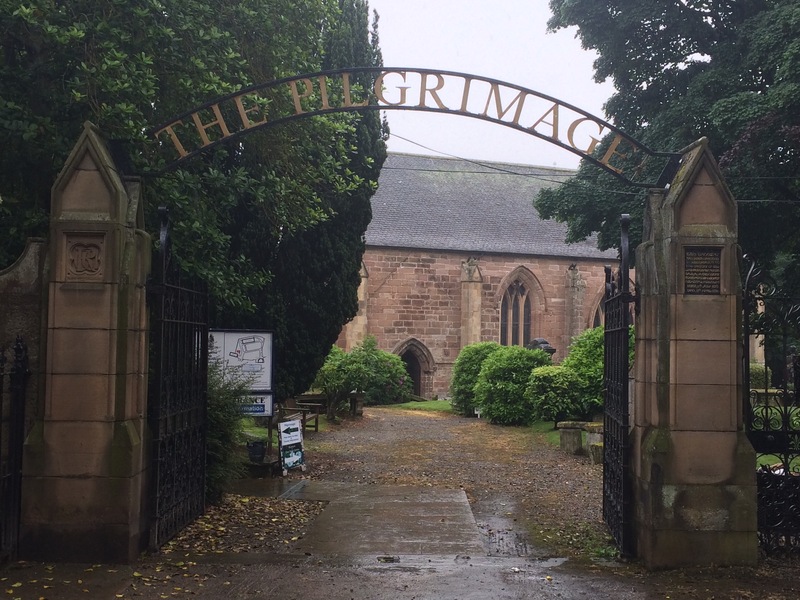 Some of his seals even said Lilleshall, Shifnal (and I noticed a Lilleshall Street when I got to Helmsdale). 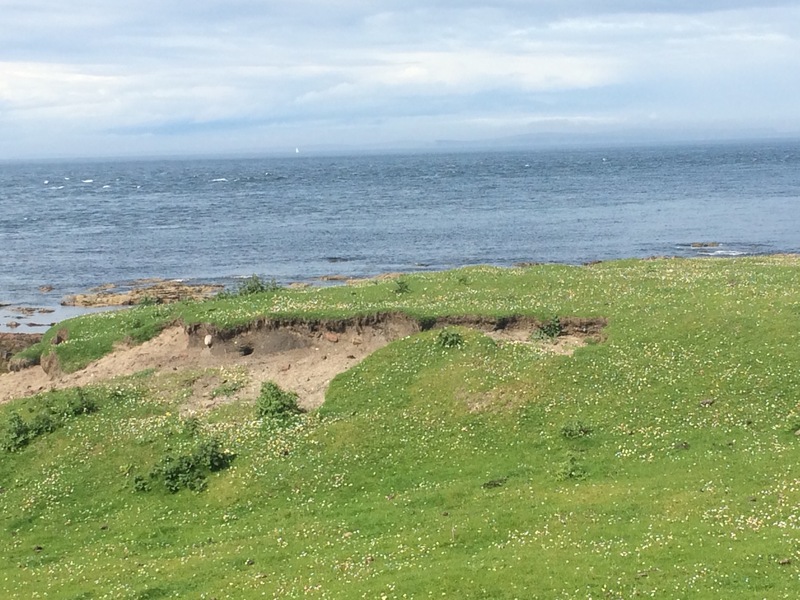 There was a coastal path from the Castle to Brora, 5 miles away. Another trial for my rucksack. Morna and I walked it and Ali drove to find a campsite. 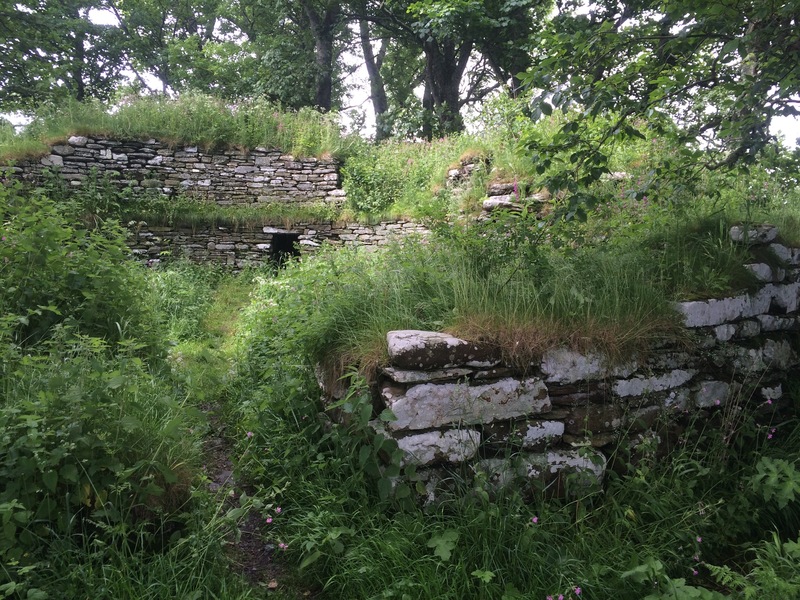 We walked past the Carn Liath Broch, which is quite well preserved. 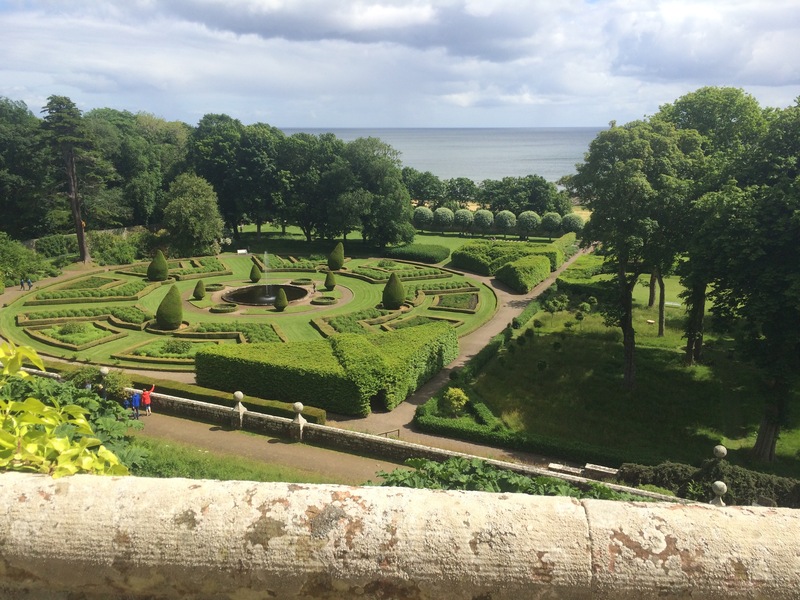 I kept stopping to look back at the views of Dunrobin Castle and the Mannie; this walk would be better heading South, although the visibility wasn’t always great as dark clouds kept rolling in. As we approached Brora there were lots of seals on the beach and in the sea. The ones in the water seemed to be mums and pups and they kept checking us out. 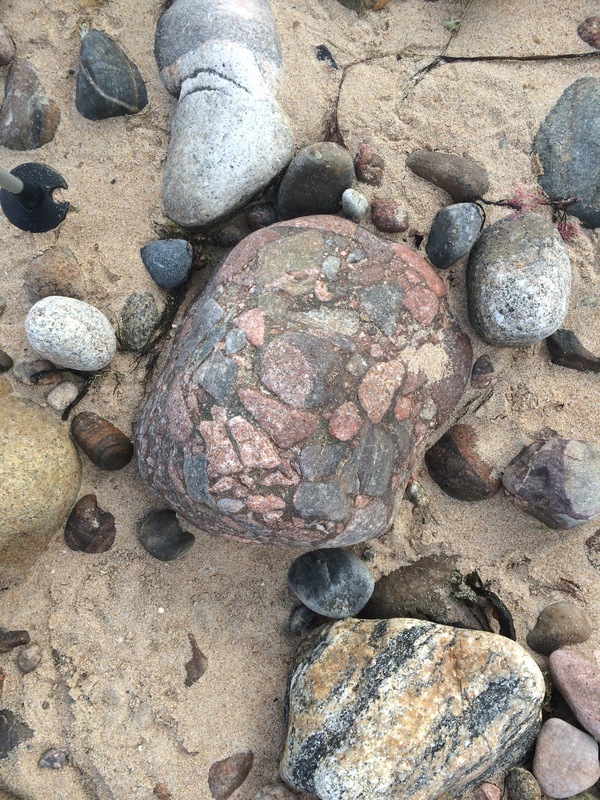 I was rather taken by the stones on the beach here as they looked like lots of pebbles had been cast together to make rocks. Arriving at the campsite in Brora it began raining again so we sheltered in the campervan and cracked open the wine. Dinner was a lovely pasta with sauce. Eventually it stopped raining long enough for me to put up my new tent and soon it was time for me to try it out. It’s not very dark inside! The Oystercatcher’s breakfast menu is overwhelming, and plenty of the dishes come with alcohol! 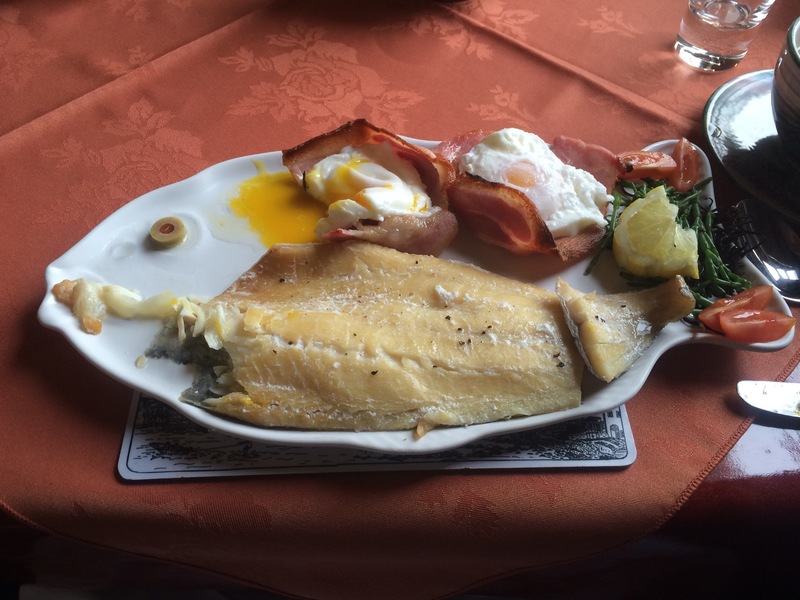 I stuck to kippers and eggs, which were beautifully served. 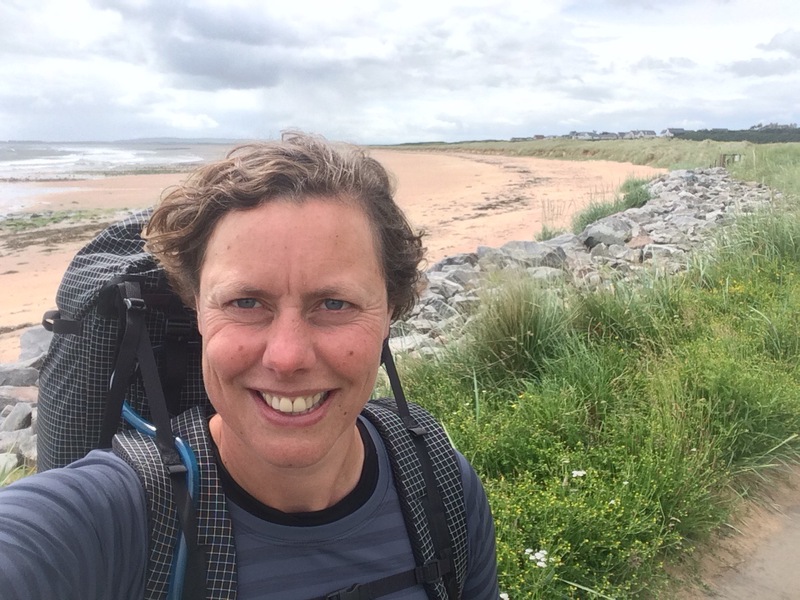 The weather forecast was for a rainy day and there was another A9 bridge to cross in order to head across the Dornoch Firth and into Sutherland. It would not be possible to walk the coast all the way to the bridge because the RAF have a bombing range on the coast. A good day to get the bus and explore a couple of the towns instead of walking. As usual around here there was one bus to Tain at 9 am and, if I missed that, there would be about 4 hours to wait for the next one. 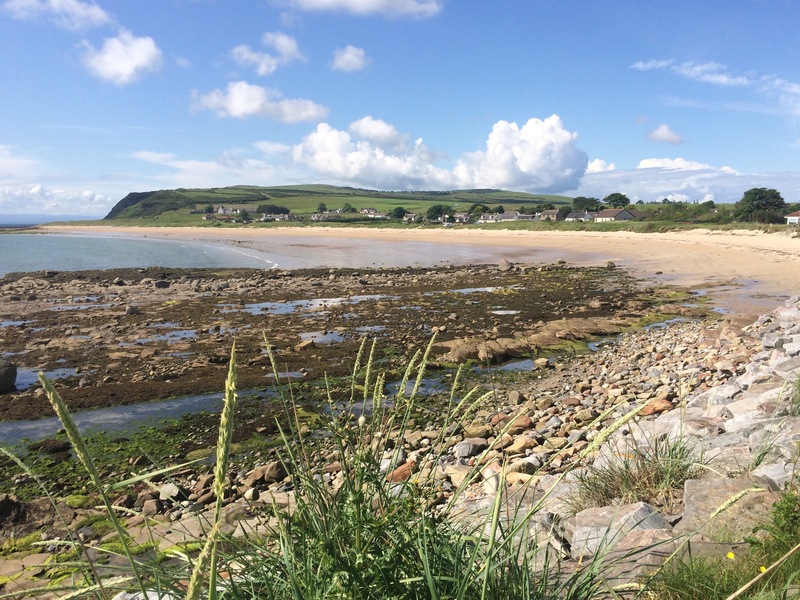 The bus passed through Inver, a small town near the bombing range that had been evacuated during WW2 as the beach here was one of those selected as a possible practice area for the D-Day landings. In the end it wasn’t used. 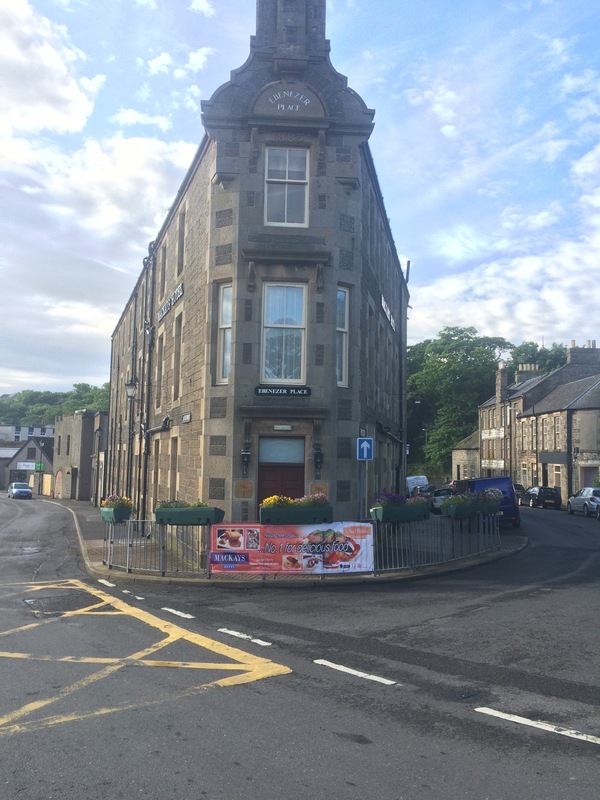 Tain claims to be the oldest Royal Burgh in Scotland, it’s Tollbooth dates from 1630, and it was the birthplace of St Duthac in about 1000AD. The museum also has a good collection of silver items made in Tain and enthusiastic volunteers who gave me a guided tour. 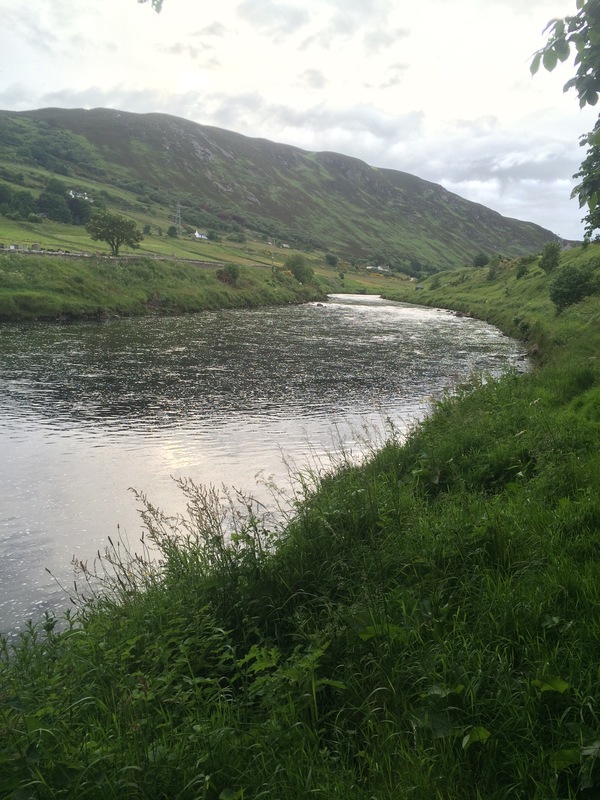 I left the Royal Burgh of Tain and got the bus across the A9 bridge and into Sutherland. 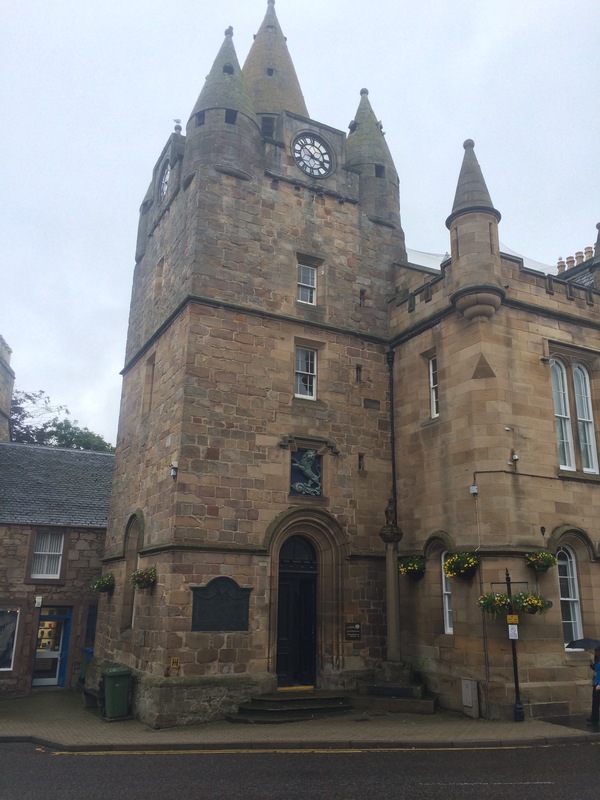 My destination was Dornoch, another pretty town and one that gave the impression of being a tourist destination. 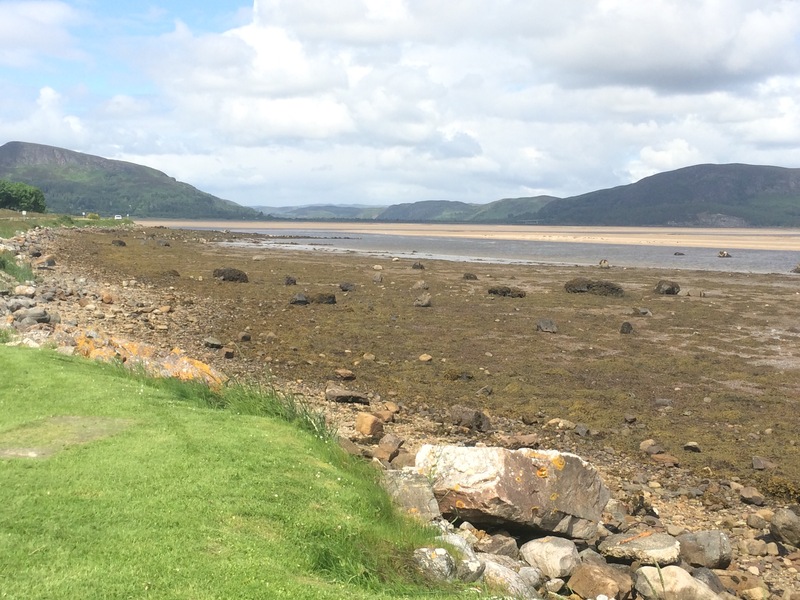 Naturally it has an impressive golf course as well as a beautiful, long sandy beach (although it was raining). The cathedral is the main draw and I was told it was where Madonna got married. 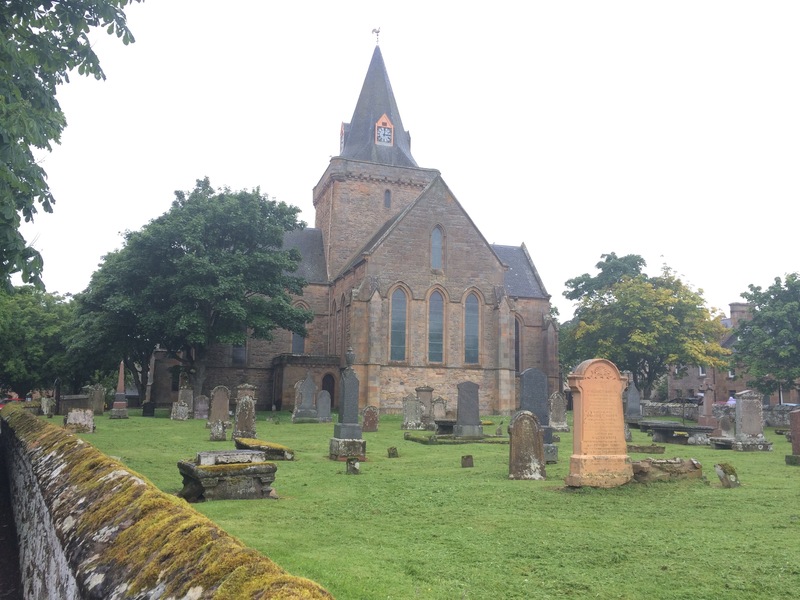 Part of the town’s market square was in the graveyard and so, amongst the gravestones, is the Plaiden Ell, a flat stone fixed measurement for merchants selling tartan cloth. After 5 weeks of waiting, my new, and much lighter, tent and rucksack arrived. Yippee. They had been delivered to Ali in Edinburgh and she drove up in her campervan to bring them to me. This was a last minute decision so I was already booked in to a B&B for tonight, escaping the rain. It was great to see Ali and Morna, and it meant I had company for dinner in the Dornoch Arms (no table for one tonight!). I spent some time unpacking my new kit, transferring everything into my new rucksack, and cutting and attaching guy ropes to my new tent. Exciting stuff. We planned a couple of short walks tomorrow, interspersed with drives, and then a night camping. This sounds like an easier way to do this trip! 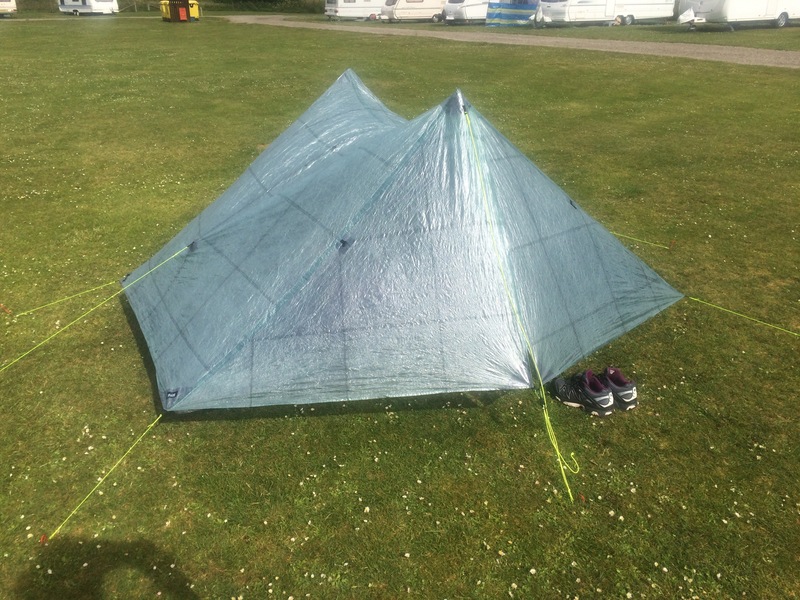 My new tent – it’s so light it’s almost seethrough! I was up early to catch a bus to Alness and then a train to Fearn in order to miss out more road walking and bits without paths. The bus was late so I missed the train (next one in 4 hours). Fortunately I managed to find 2 buses that could get me to Shandwick via Tain. 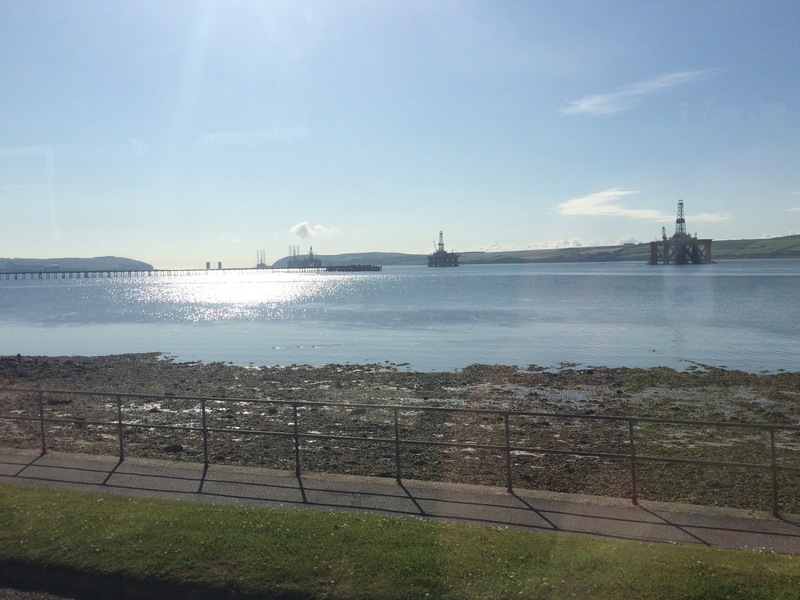 The bus route took through Invergordon and around Nigg Bay. Considering the thousands of cruise liner passengers that come through Invergordon it looked a bit run down, although I did like the murals on the ends of lots of the buildings. 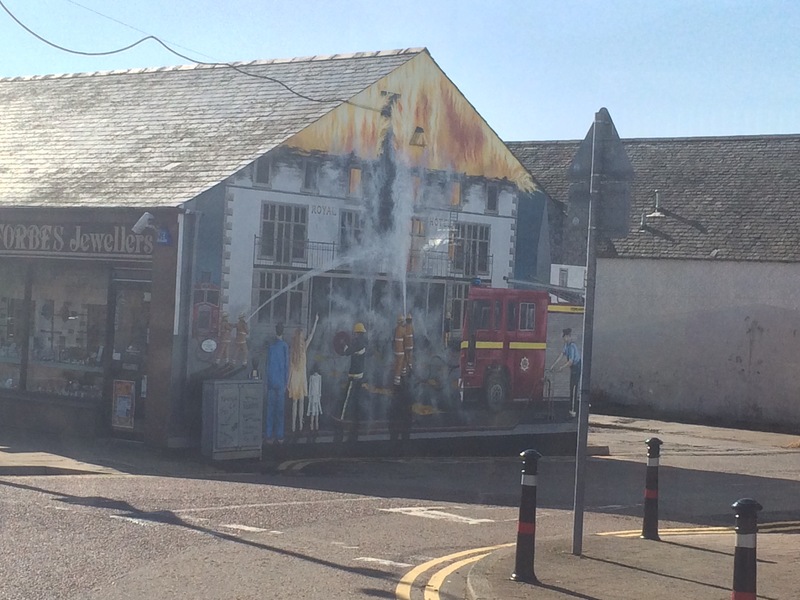 I arrived in Shandwick at 10 am and the sun was shining and it was getting hot. 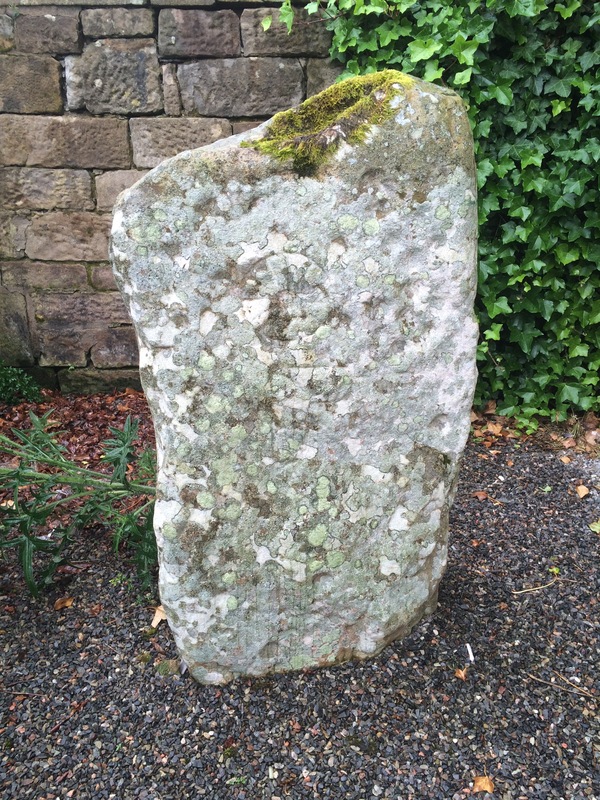 I walked South for half a mile to check out the Sandwick Cross Slab, one of the Pictish stones that I had read about in the Rosemarkie museum. It is on a hill in a farmer’s field and is now protected by a glass case. Seems a bit of overkill as it’s lasted at least 1200 years without one. Shandwick Bay has a nice sandy beach and lots of signs pointing the way, indicating it is a popular spot, just not today. 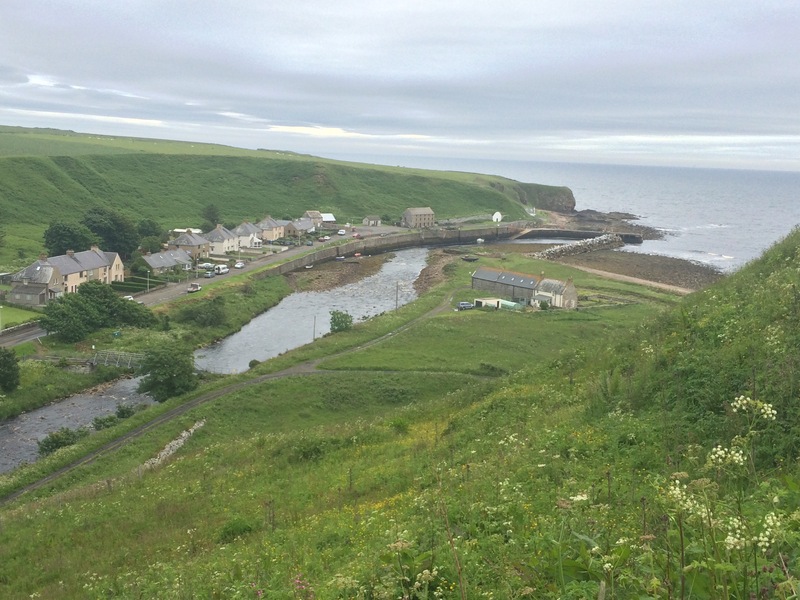 I walked through the village into Balintore. 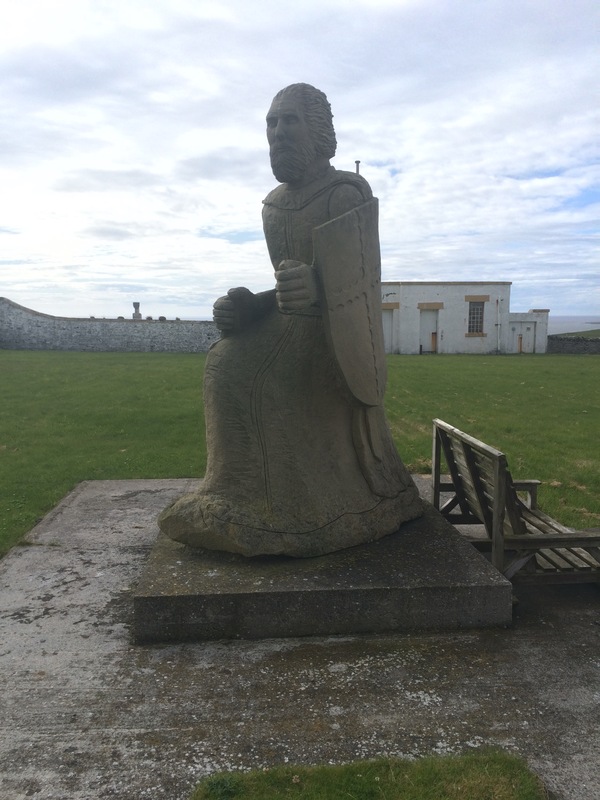 The 3 Seaboard Villages of Shandwick, Balintore and Hilton all merge together and have quite a bloody history as the scene of several battles between the Picts and the Vikings. 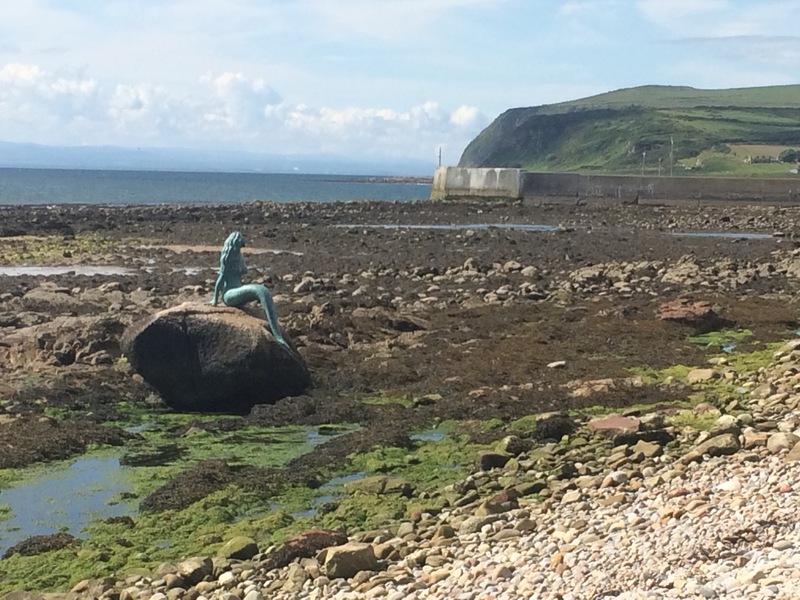 They also thrive on folklore and there is a mermaid on the beach (apparently a local man married one once). 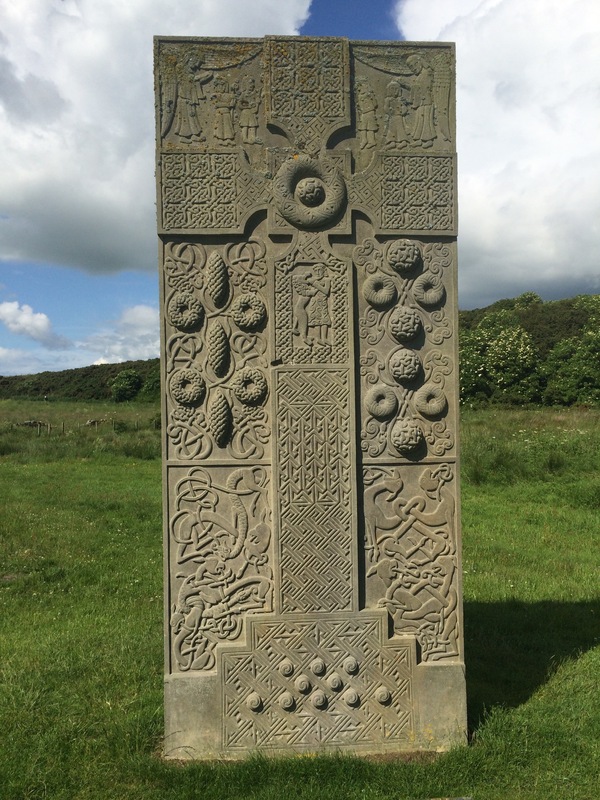 Hilton of Cadboll also has a Pictish Cross Slab, although this one is only a replica as the real thing is in a museum in Edinburgh. From here there was a sign for the path I wanted to Tarbat Ness and a notice board telling me it was an “easy 10 miles”. Hmmm. After about a mile, just past the disused fishermen’s huts, the path petered out. There was a track sort of visible but it was very overgrown and I was yet again forcing my way through. I suffered several nettle stings, one on my shoulder (that’s how high they were). Sometimes, for a change, I walked over the shingle, but that was probably harder going and I felt more likely to break an ankle. Despite the tough going being sandwiched between the sea and the cliff, the scenery was lovely and the sea looked very inviting. As I approached Tarbat Ness I came across a small patch of beach between the rocks so I took the opportunity to strip off and take a dip. The water didn’t feel particularly cold and it was incredibly refreshing on a hot day. 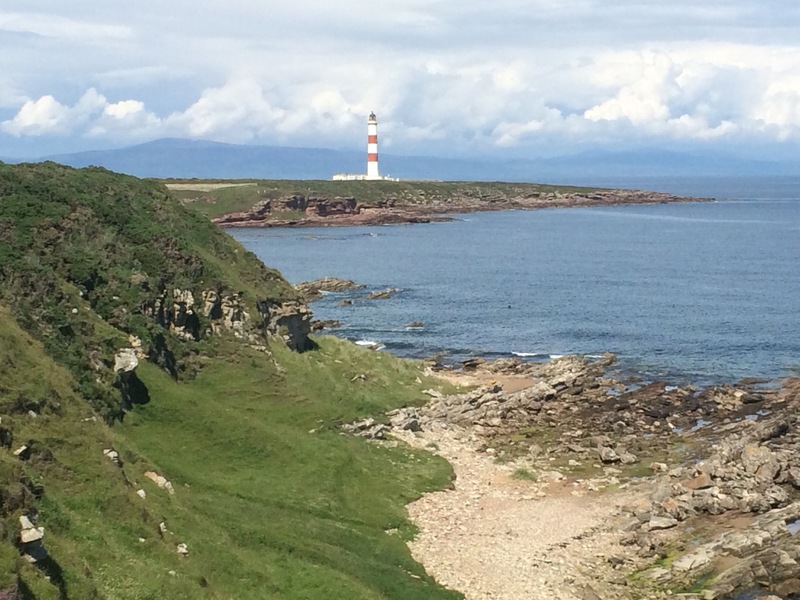 A 40m tall red and white lighthouse stands at Tarbat Ness, which marks the point where the Great Glen fault line, that splits the Highlands in two, finally meets the sea. From here I could clearly see the mountains further North across the Dornoch Firth. 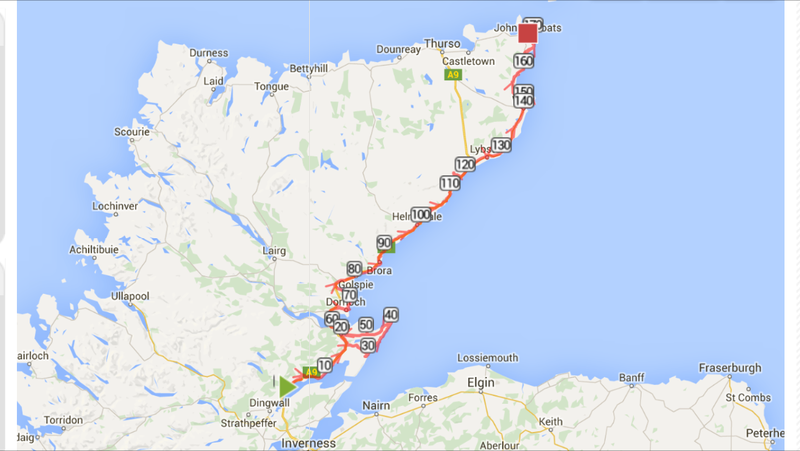 The going does not look easier across the Dornoch Firth!!! 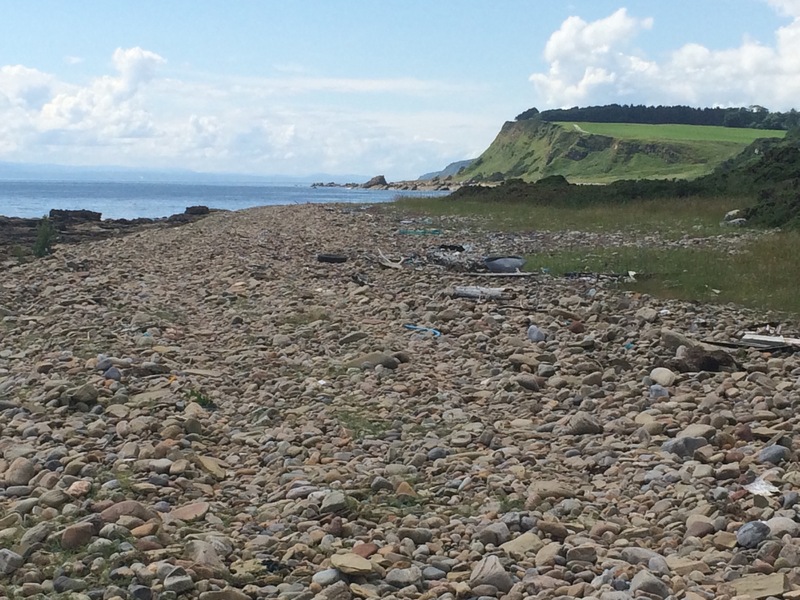 I walked the last couple of miles along the minor roads to Portmahomack on the Northern shore of Easter Ross. I was booked in to the Oystercatcher B&B, which has a restaurant with a fine reputation. Unfortunately it is closed on Mondays. I sat outside enjoying a beer and watching the clouds roll in before retiring to my room for a microwave meal.